Need a timeless gift? 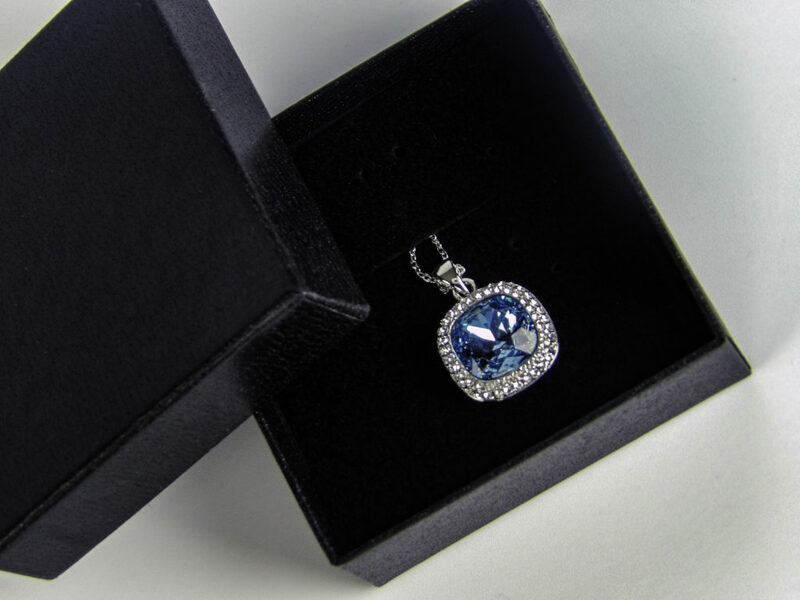 This gift-boxed Gem Stone King has a focal piece of a 1/2 inch Bermuda Blue Swarovski crystal on an 18-inch chain. The look is modern but it has decidedly classic overtones, channeling your inner Grace Kelly or Audrey Hepburn while still being versatile enough a piece to suit an “Au Courant” wardrobe ranging from casual to formal outfits. 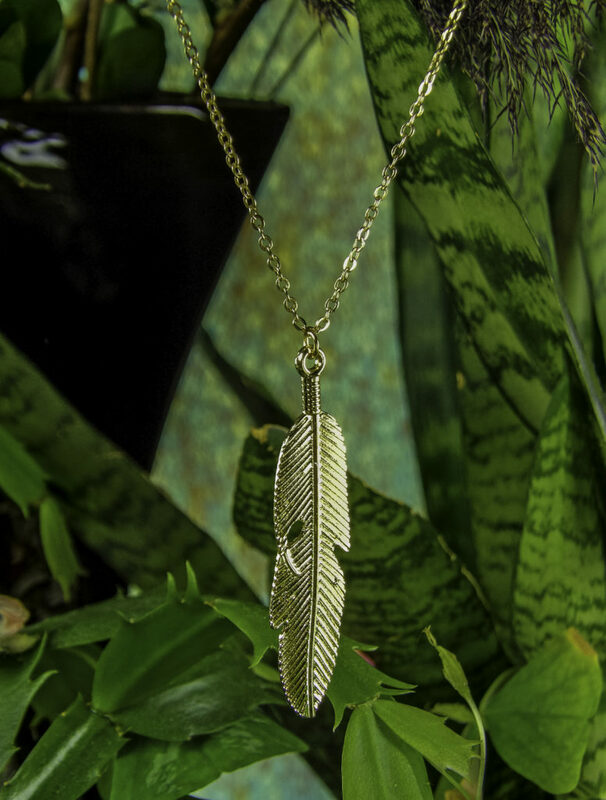 If you’re looking for a signature necklace for yourself or a tasteful gift, this piece is an excellent choice because it made of quality materials and superior construction. As a New York City-based diamond wholesaler, Gem Stone King oversees local production to keep costs low while employing old world methods with modern technology. 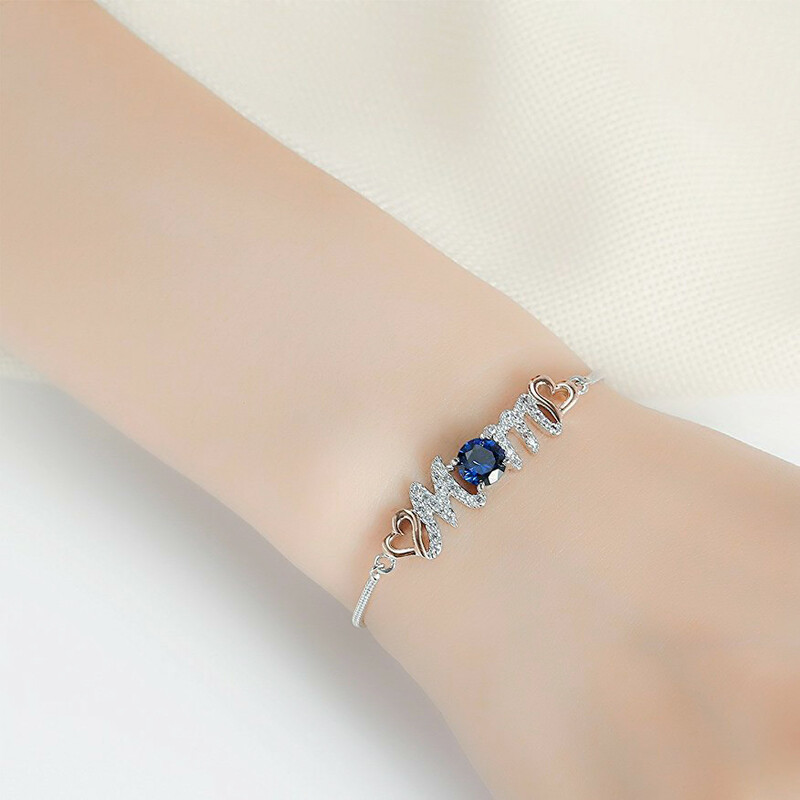 They sell jewelry online directly to consumers. Because of this, they offer a much higher quality item that is typically seen for the price point. 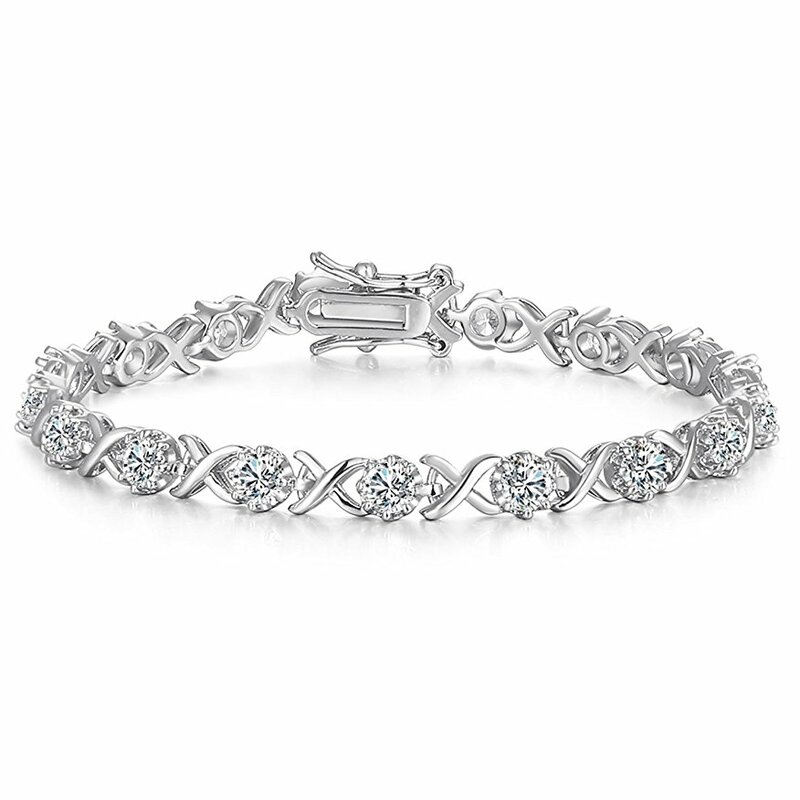 This particular piece uses a Swarovski Crystal Gemstone with a precision-cut as often seen on diamonds to enhances the sparkle and clarity. It is classic and elegant, yet sleek enough to feel modern. 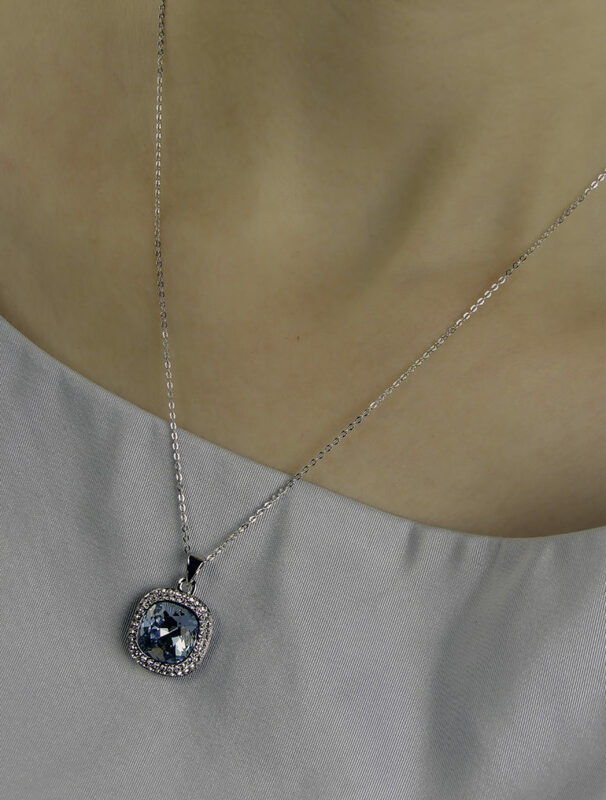 The gem stone is a rounded square with a cut to maximize the sparkle in the light. 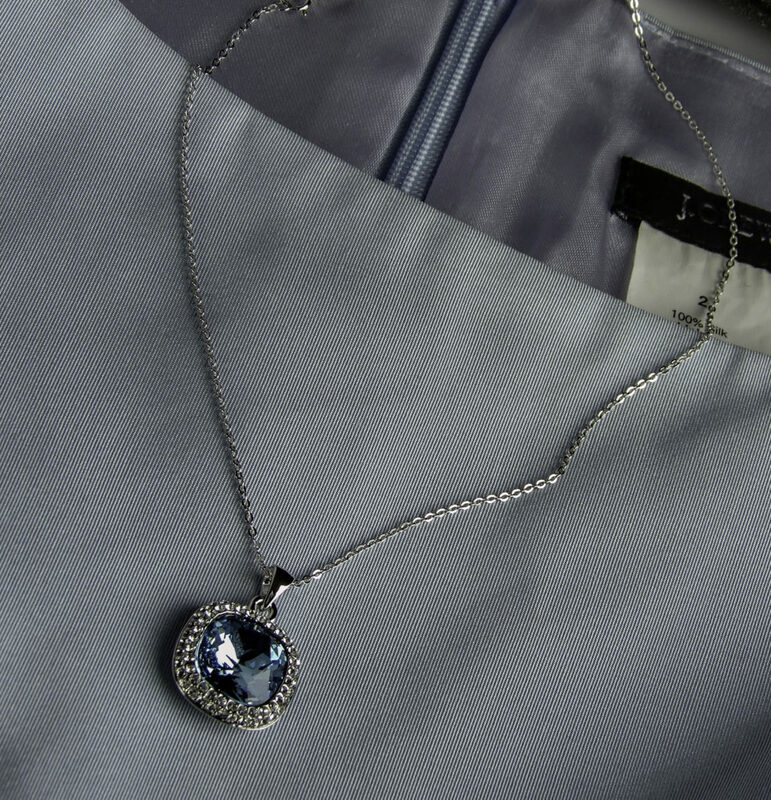 The stone itself is transparent without blemishes. The Bermuda Blue color is very versatile, vibrant and even. 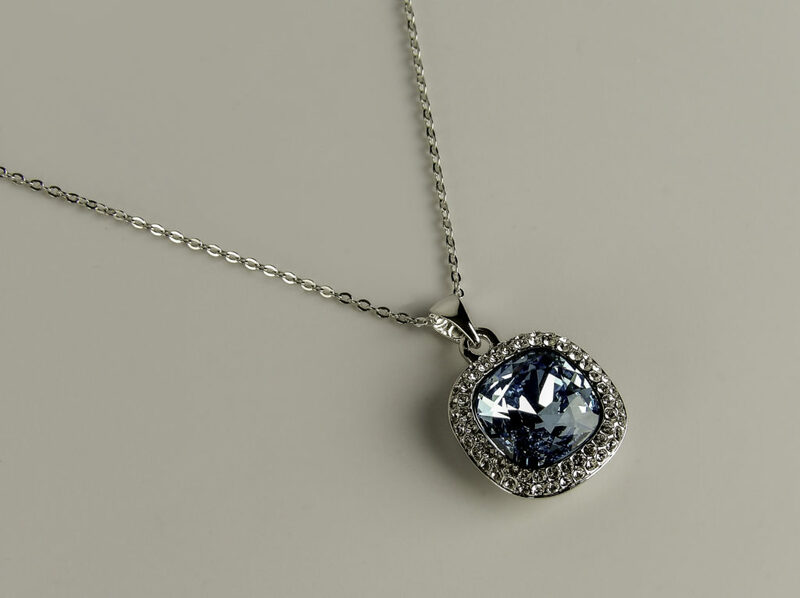 The center stone is surrounded by a double row of small white crystals that have a great deal of sparkle. It works with icy pastels, white, deep vibrant blues such as royal and cobalt, as well as neutrals, creams, and linens and even contrasting brights like orange. 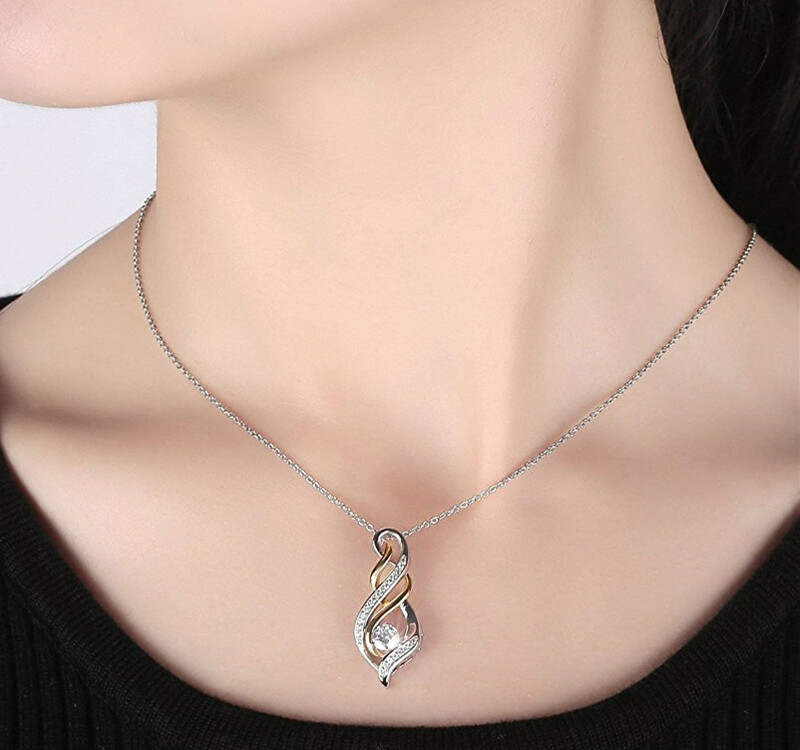 The clean lines of the necklace look particularly nice with an open neckline. The Swarovski brand is renowned for creating crystals that have astounding light and sparkle due to their precise cutting methods. Swarovski uses a patented machine to perfect the look of a hand-cut to make crystals of high brilliance like a diamond available for the price of a crystal. Because Swarovski crystals have such a glamorous sparkle, they are frequently used in costumes, bridal wear, and designer gowns. 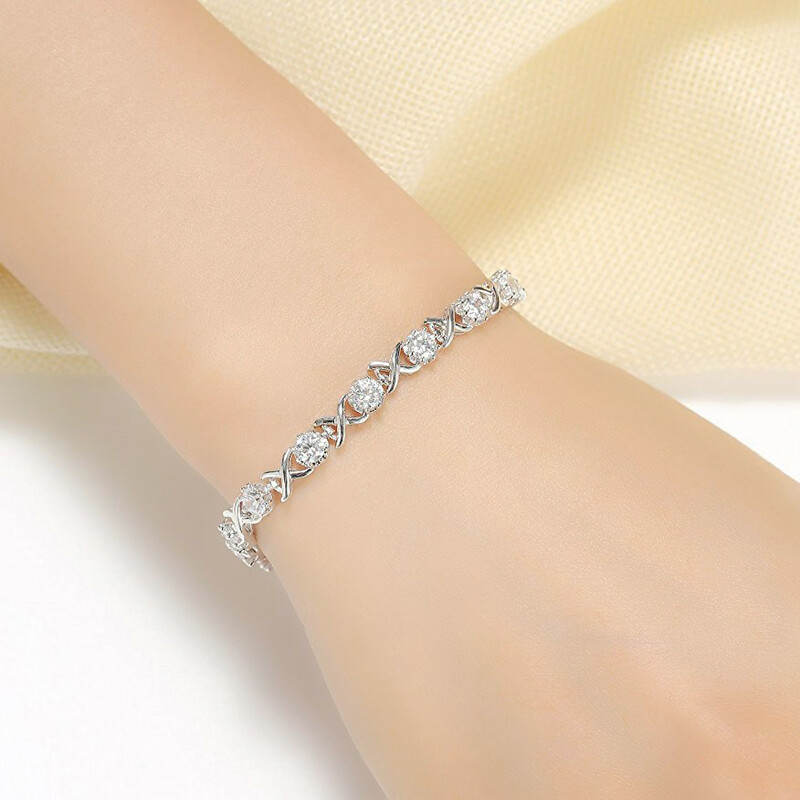 The spring-ring clasp is sturdy and the stone setting is secure. 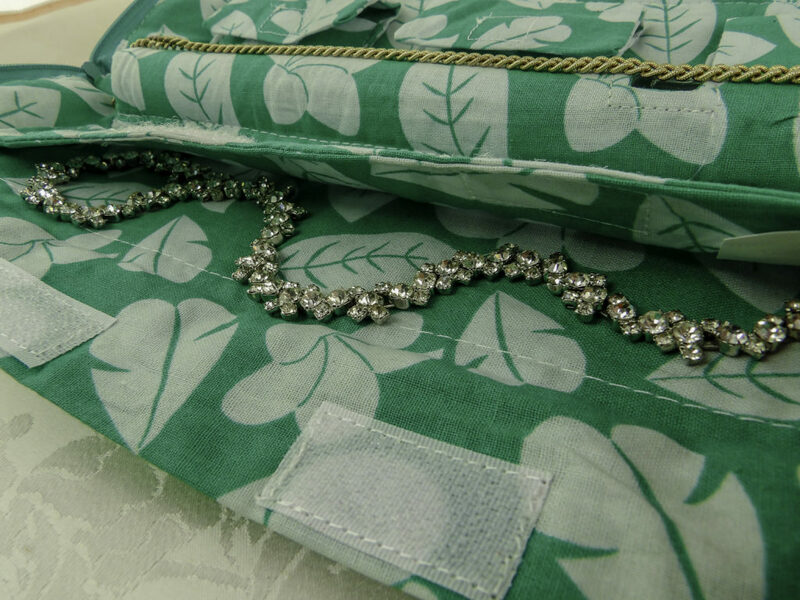 The cable necklace chain does not catch on delicate fabrics such as silk or satin. The clasp is marked and the chain is of particular high-brilliance. 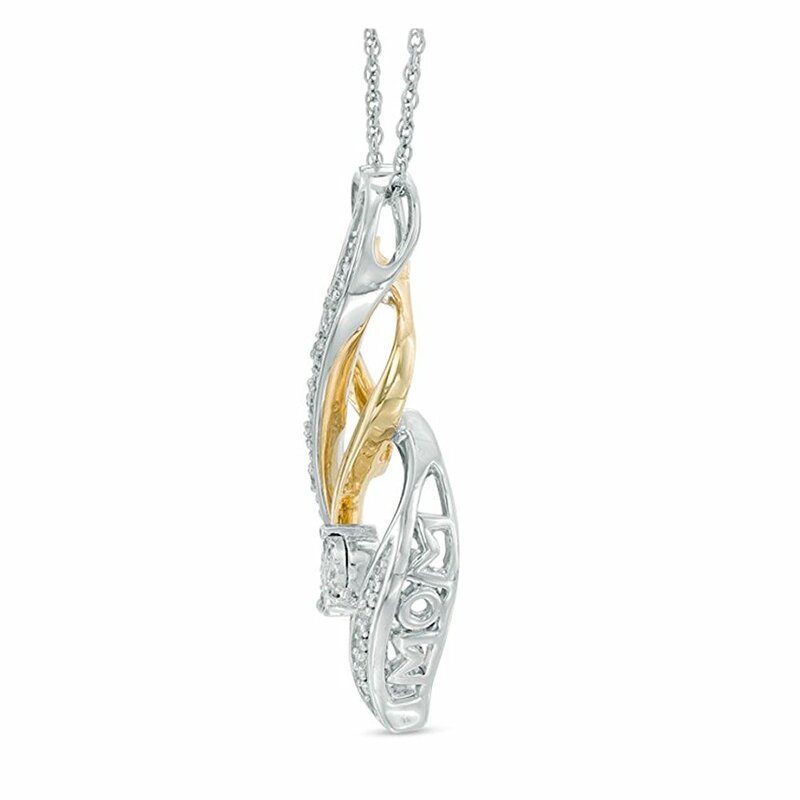 The focal piece, clasp, and chain are Rhodium plated for high luster and durability. 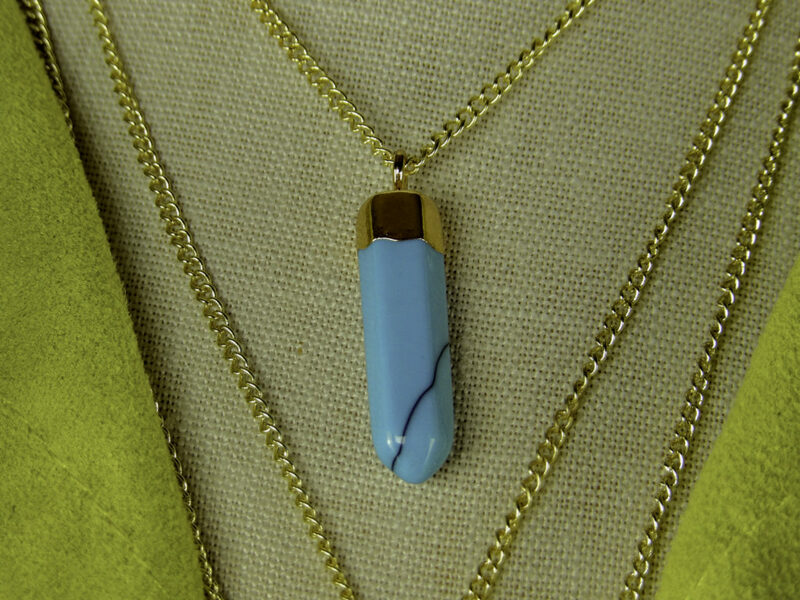 The pendant comes gift boxed. 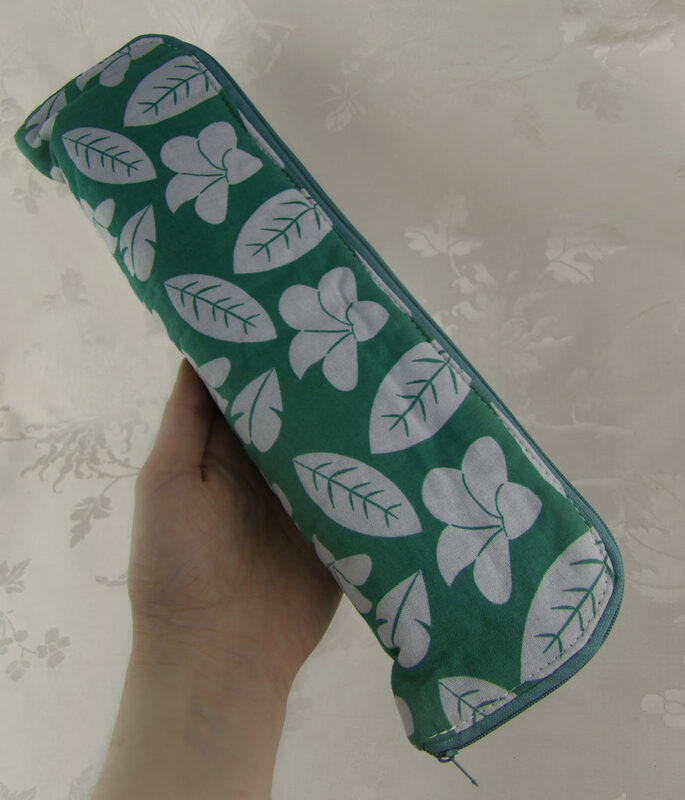 It makes an ideal gift item for a milestone event or just because for someone special, such as for a bridesmaid gift, a girlfriend, mother or a friend who has a sleek yet elegant style. 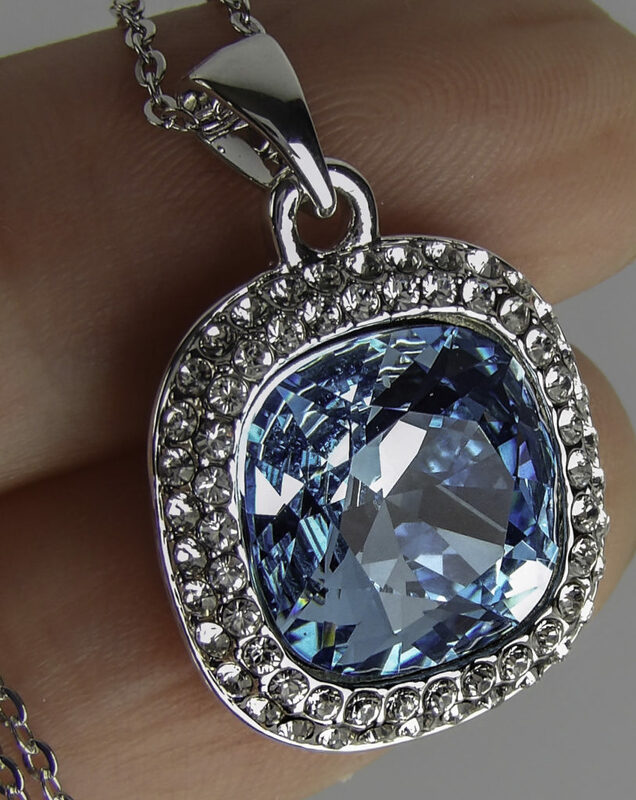 Gem Stone King is a leading online jewelry company with over 5 million internet sales. The Gem Stone King family has been in the diamond business for over 100 years. The president is a fourth generation diamond merchant. Based in New York, New York, their jewelry is mainly manufactured in the United States. All Gem Stone King diamonds are conflict-free from authorized sources with a Kimberley certificate. 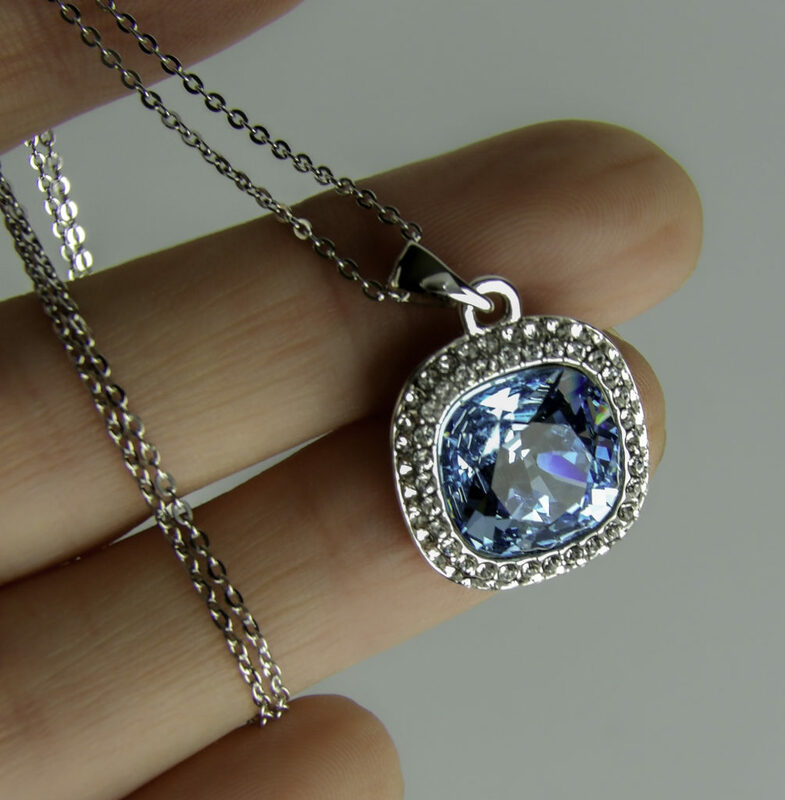 A high-end look at an affordable price point, this Gem Stone King Bermuda Blue Swarovski Crystal Pendant has quality workmanship paired with the brilliance of a classic yet modern focal piece which is cut in the Swarovski tradition for maximum sparkle. In its’ own gift box, it makes an ideal gift for someone who loves elegant, sleek jewelry. 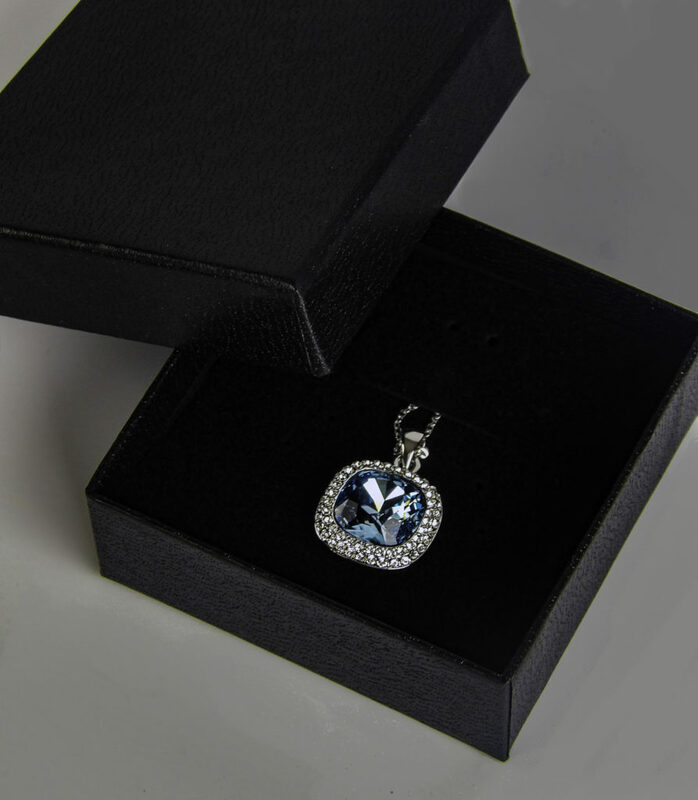 Style Chicks received the Gem Stone King Bermuda Blue Swarovski Crystal Pendant in exchange for our unbiased review and received compensation for our time and effort. However, our experience with the product and the opinions expressed in this review are 100% ours. 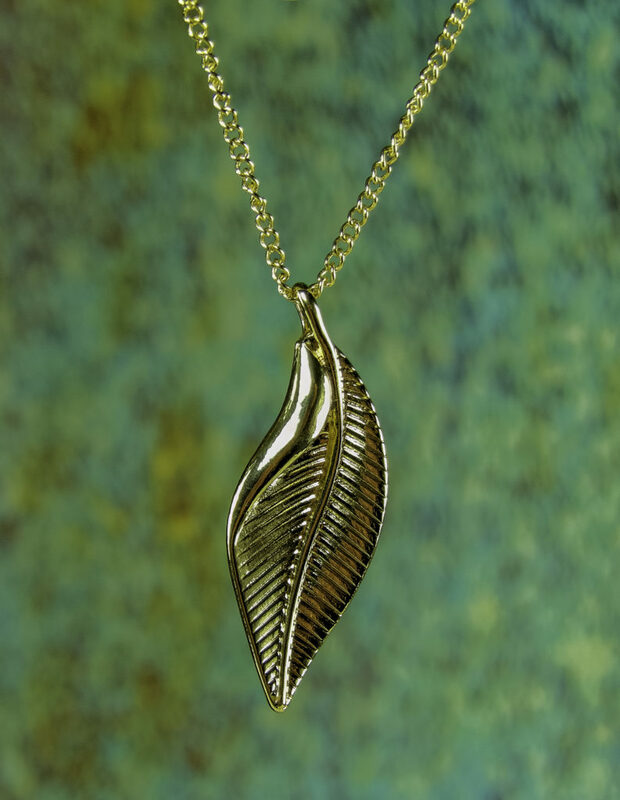 Still looking for the perfect jewelry gift for someone special? Here is our list of several pieces of for Moms, teens, young girls, gal pals, bridesmaids, and grads. Find something for everyone including several choices for Mom, your minimalist friend, the romantic, the life of the party, a girlfriend, a teen, the traditionalist, or the modernist who still loves a nod to the classics, but with a twist. And bonus, most of these come in an elegant or decorative gift box. In a rush? All of these pieces are affordable and available on Amazon and can ship to be there just in time! 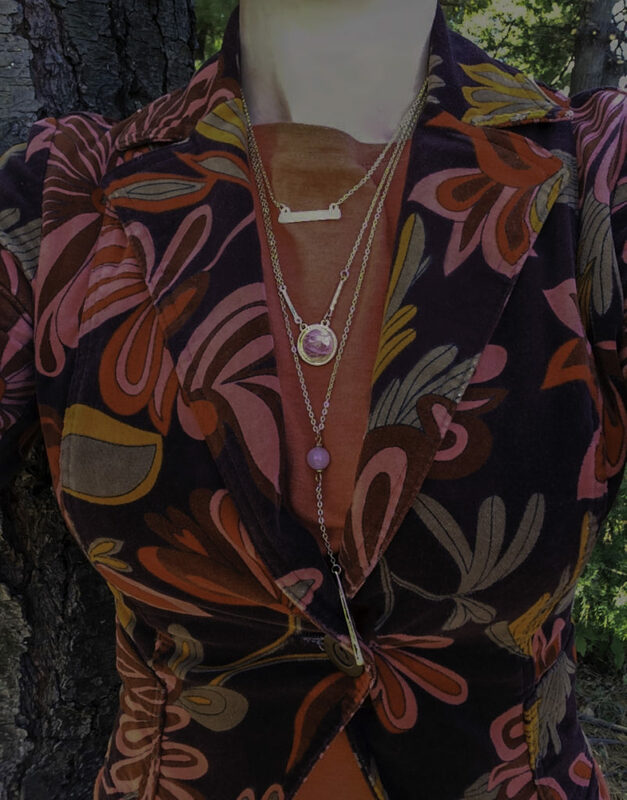 Drop focal piece necklaces look wonderful with scoop necklines and are often a favorite piece of jewelry because the focal piece colors can really tie an outfit together. 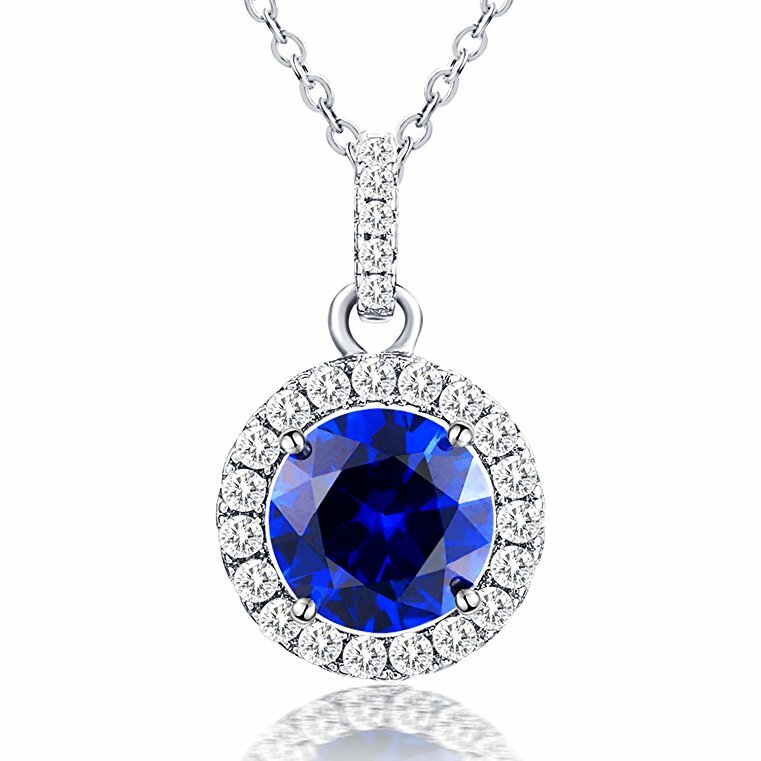 Vibrille Round Cut Created Sapphire & CZ Pavé Halo Drop Necklace made of .925 Sterling Silver is white gold rhodium plated for extra shine and durability, this is an 8.0mm lab-created blue sapphire bordered by an open halo frame of sparkling best white cubic zirconia. 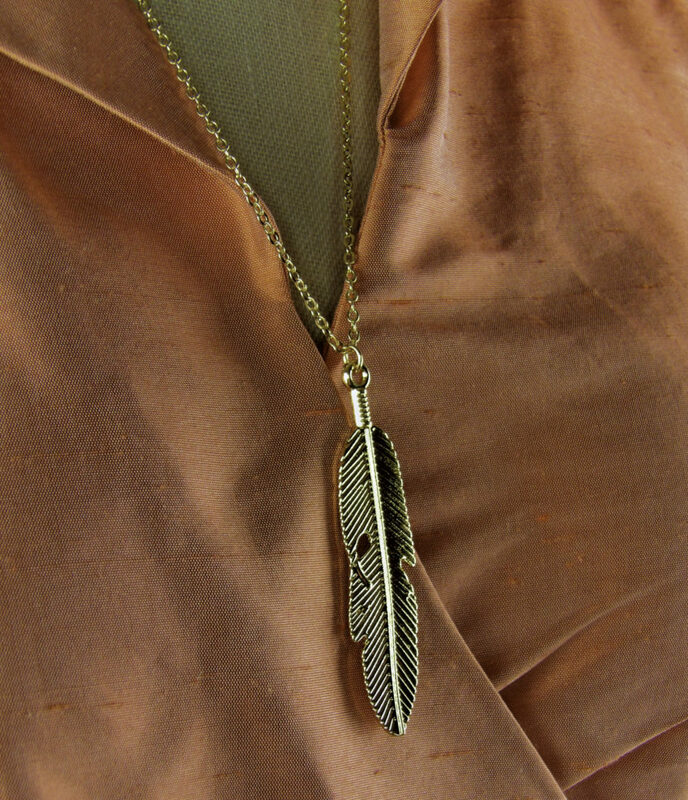 The chain is a delicate and feminine length of 18” inches but it is the adjustable length to best flatter the neckline. 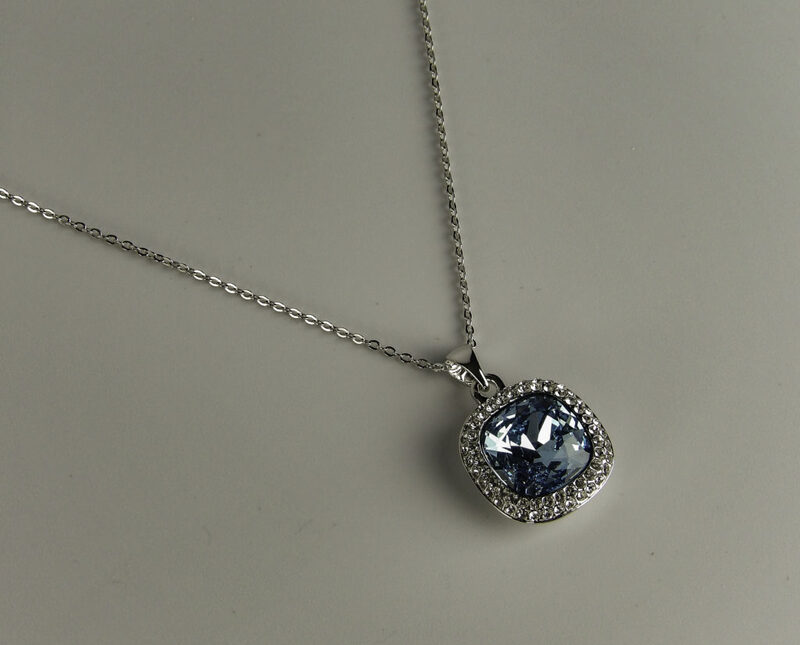 The stone has a nice sparkle and detailing, and sells for $26.99. It also comes in Created Ruby & Rose Gold Plate. It comes in a gift box that is ideal for gift giving. 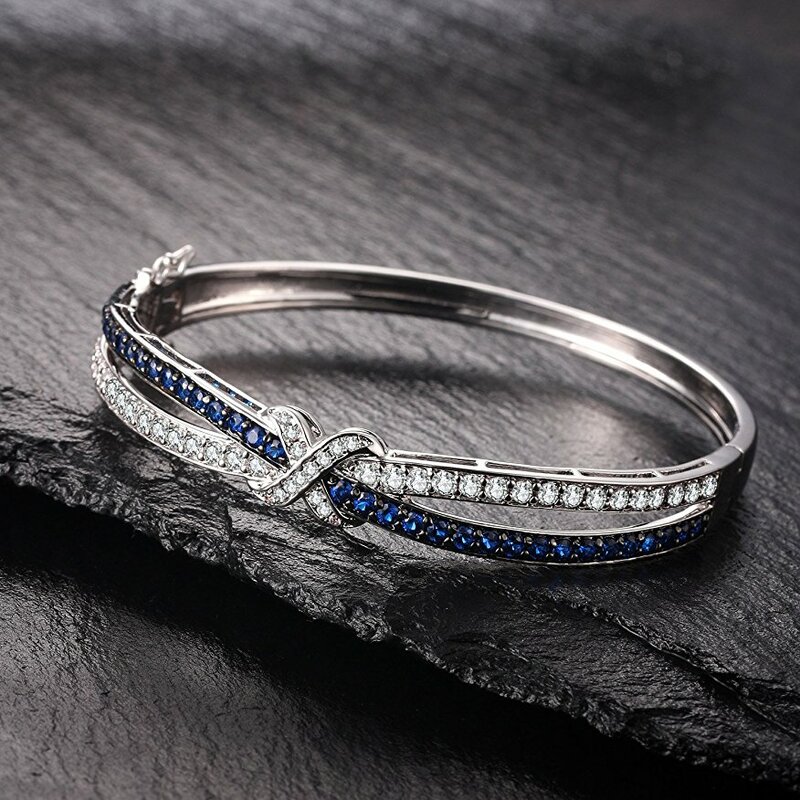 Love sapphires but want something more trendy? 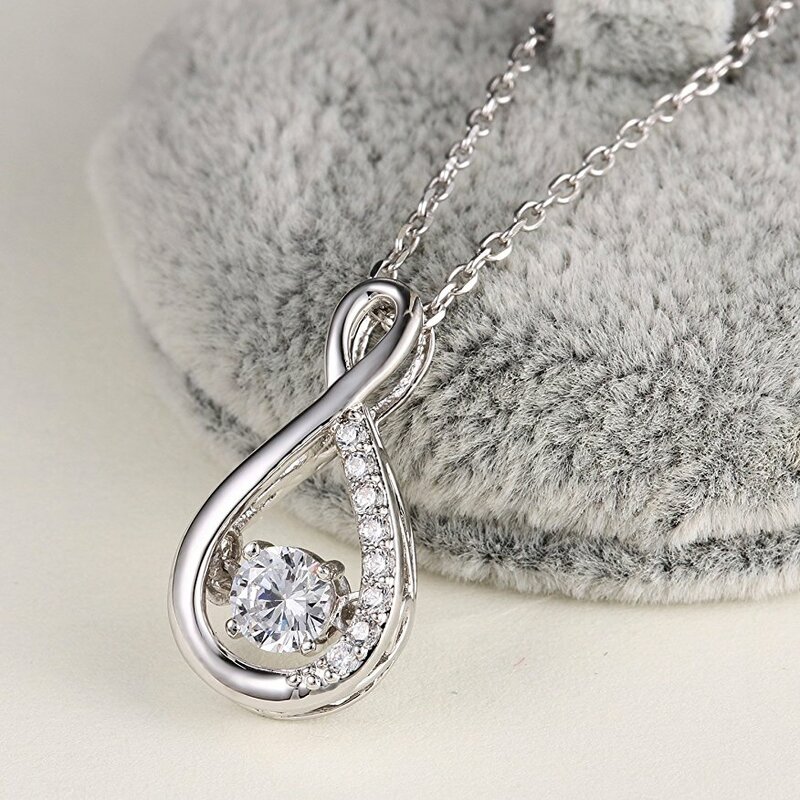 another option is this very popular infinity necklace, by GuqiGuli. 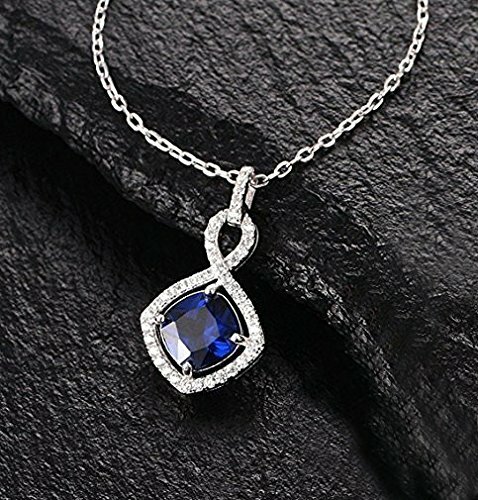 The GuqiGuli Cushion-Cut Created Sapphire Drop Infinity Necklace has a bit more edge to it than the lady-like round cut seen above, it is Sterling Silver on an 18” inch chain, which is an 18-inch length” necklace with the adjuster, 16 inches without. 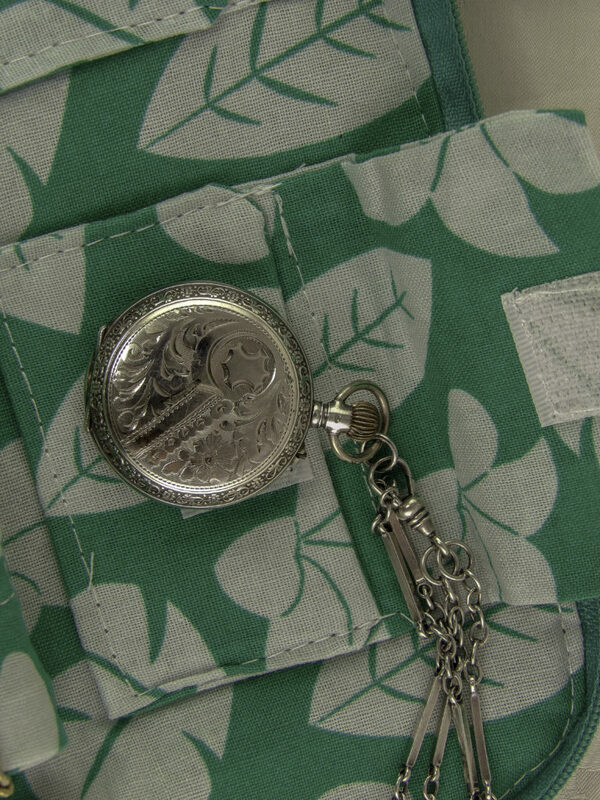 The pendant is 0.9 inches height and a half inch wide. It has a strong lobster claw clasp and sells $29.99. 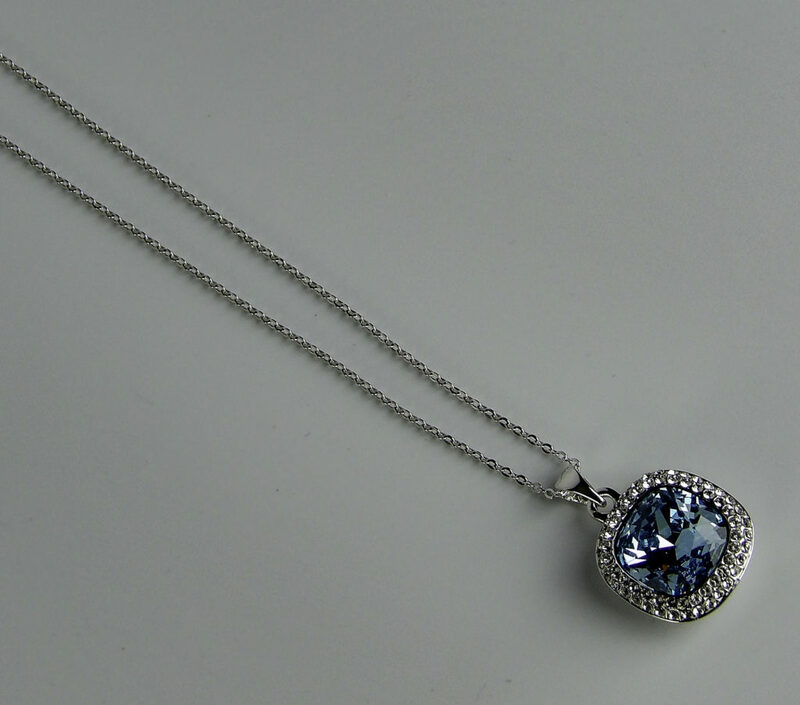 Foruiston Created Sapphire & CZ Pavé Infinity Necklace in Sterling Silver, 18”, $27.99. Veterinary student, dog groomer, Mom of fur babies, animal lover. 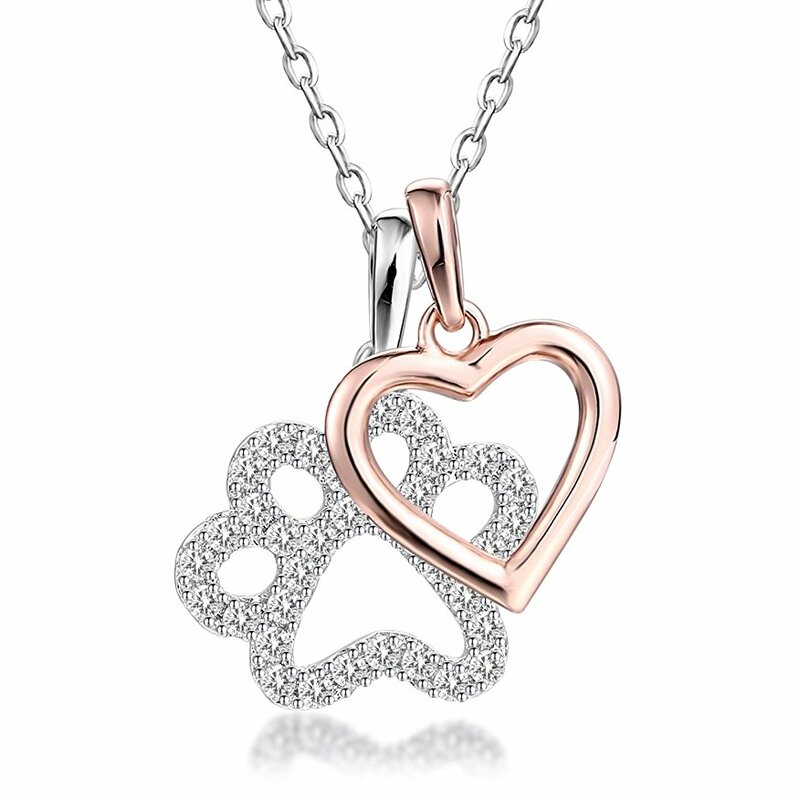 For the friend who loves animals, there is the GuqiGuli ‘Good Luck & Love’ Pavé CZ Paw Print & Rose Gold Heart Necklace in Sterling Silver, for $31.99. Adorable gift for animal lovers! 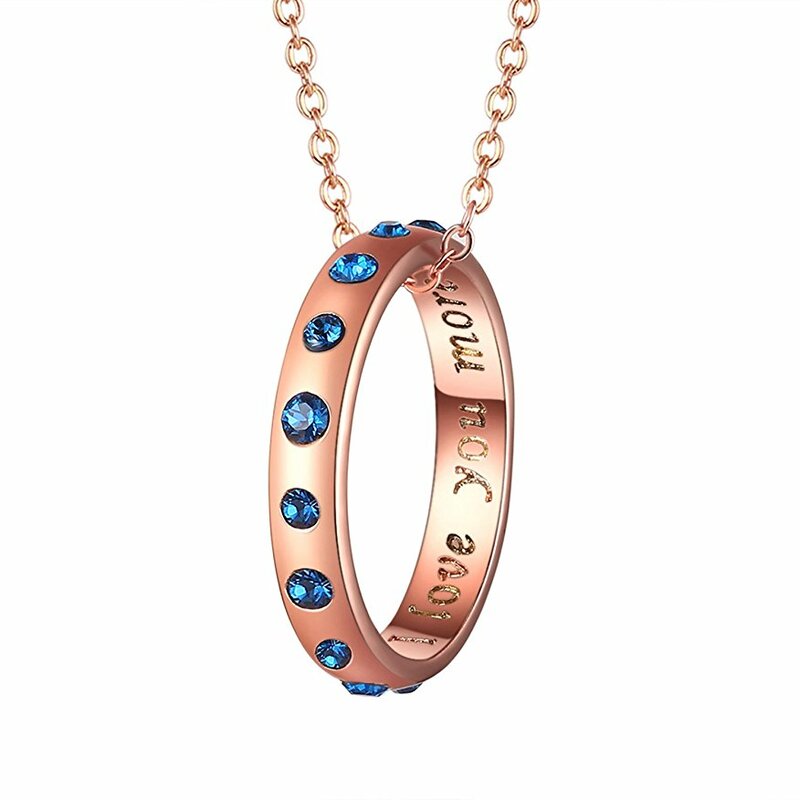 Foruiston Rose Gold Tone Royal Blue Swarovski Crystal “I Love You More” Open Circle Necklace, emulates the romantic ring on a chain look, with crystals around the outside and sentiment inscribed on the inside. The chain is 18 inches long. It sells for $24.99. 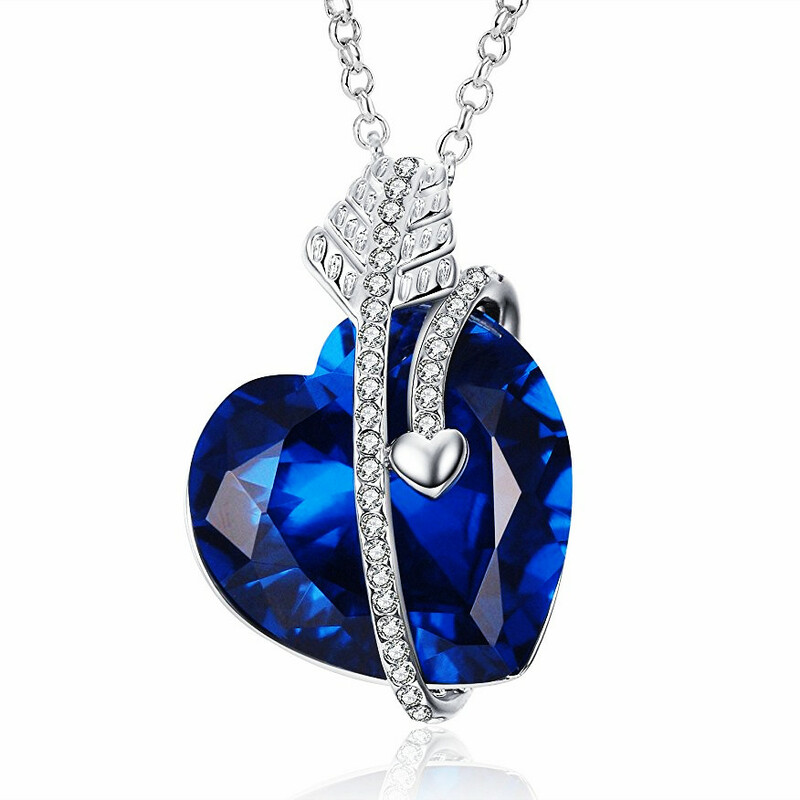 Caperci Heart Cut Created Sapphire & CZ Pavé Special Love Necklace in .925 Sterling Silver and warm white gold plate on an 18′-inch chain. 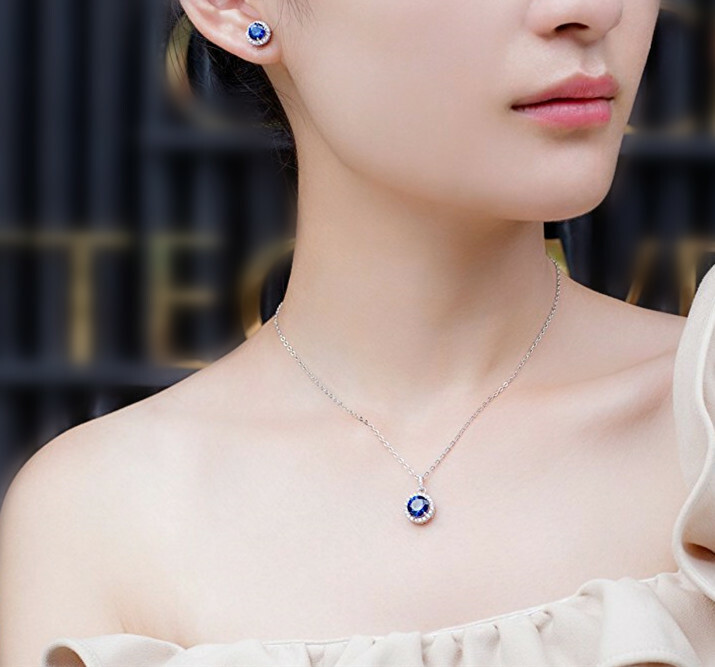 The lab created sapphire is brilliant and bright, and is set with a three-point heart-cut with a twisted bottom for visual interest, it has sparkling cubic zirconia accents in a crescent. 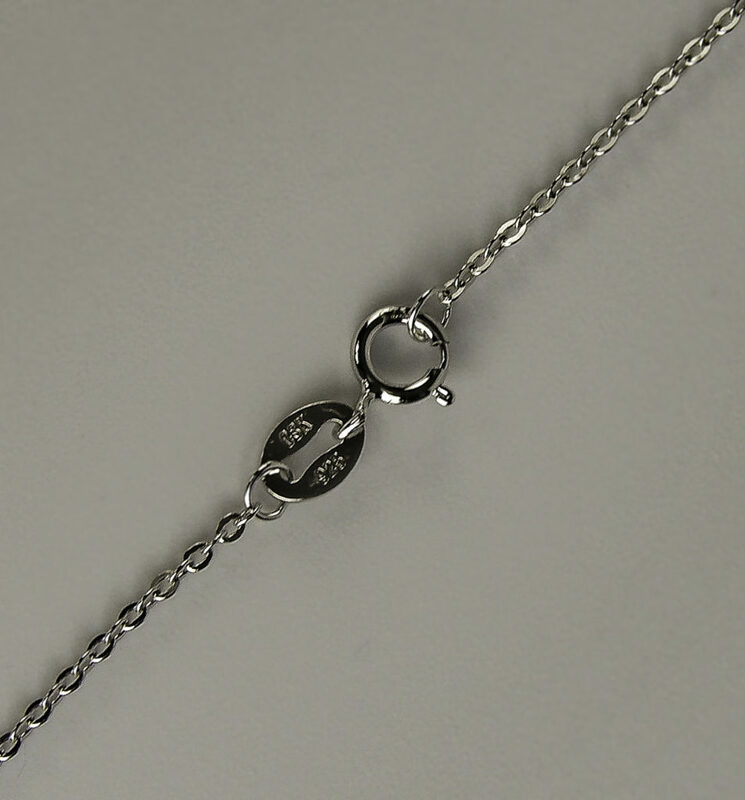 The chain also has an extender, and comes in a jewelry gift box. It sells for $31.99. 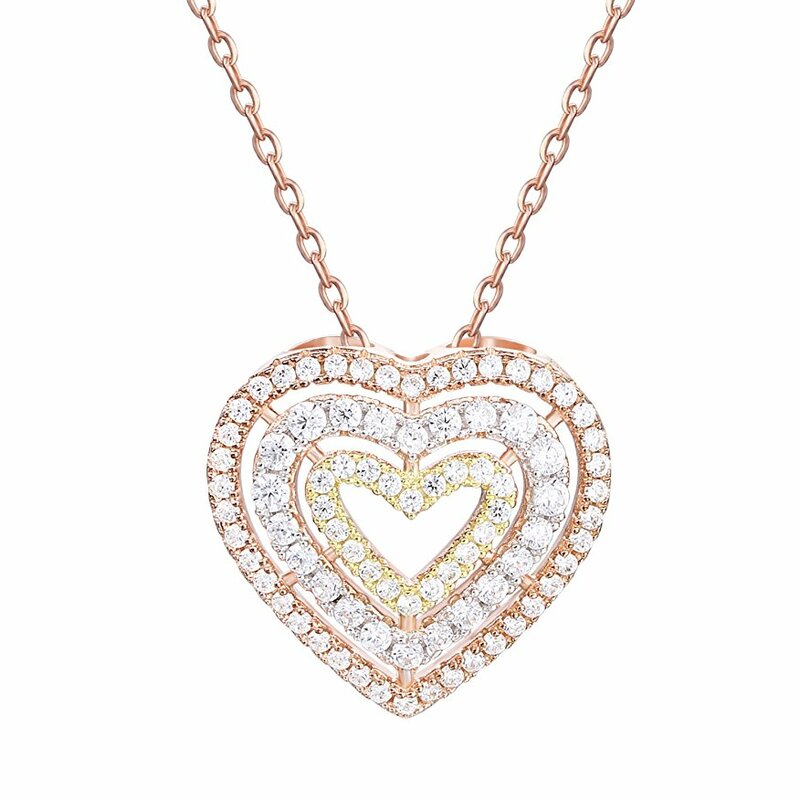 GuqiGuli Three-Tone Gold Three-Heart Pendant Necklace in Sterling Silver or rose gold on an 18” inch chain. 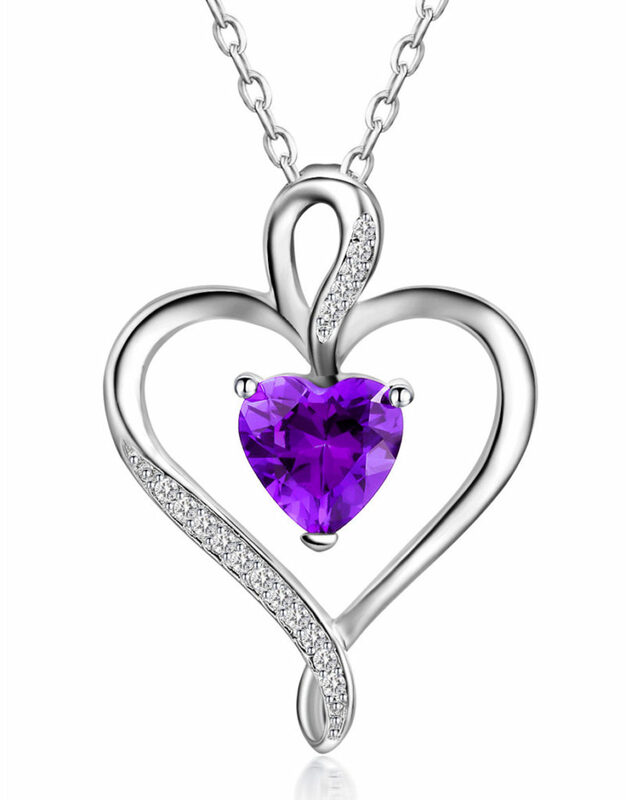 This one makes a subtle statement with a three-dimensional look to the three hearts grouped together. The clustered design gives more of a diamond-like appearance. It sells for $32.99. 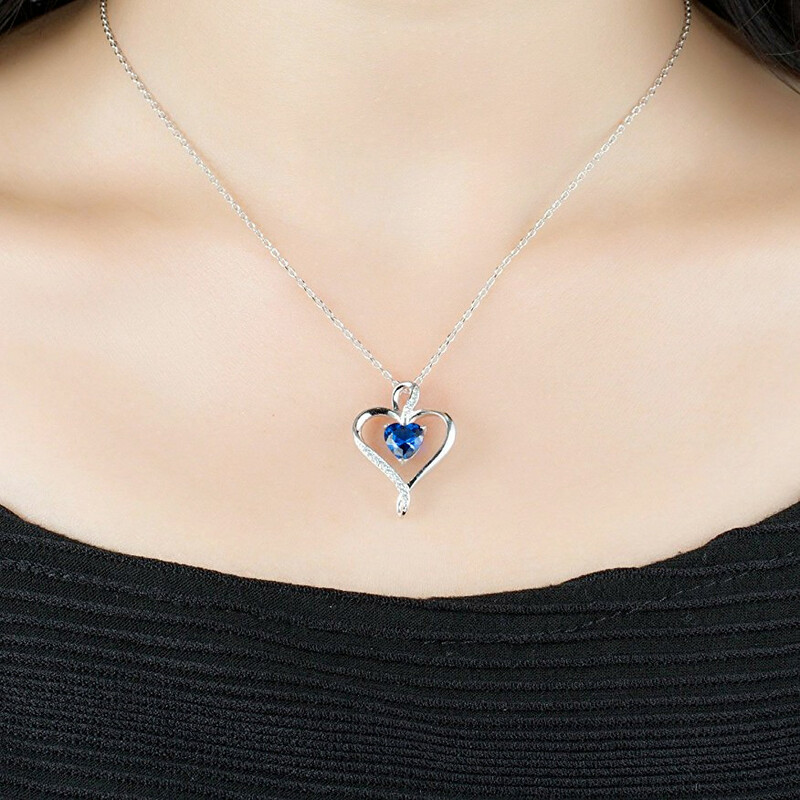 Caperci Created Blue Sapphire Cupid’s Arrow Heart Necklace, also available in Amethyst and White Sapphire on an 18″ chain for $25.99. LOVER OF ALL THINGS PINK! 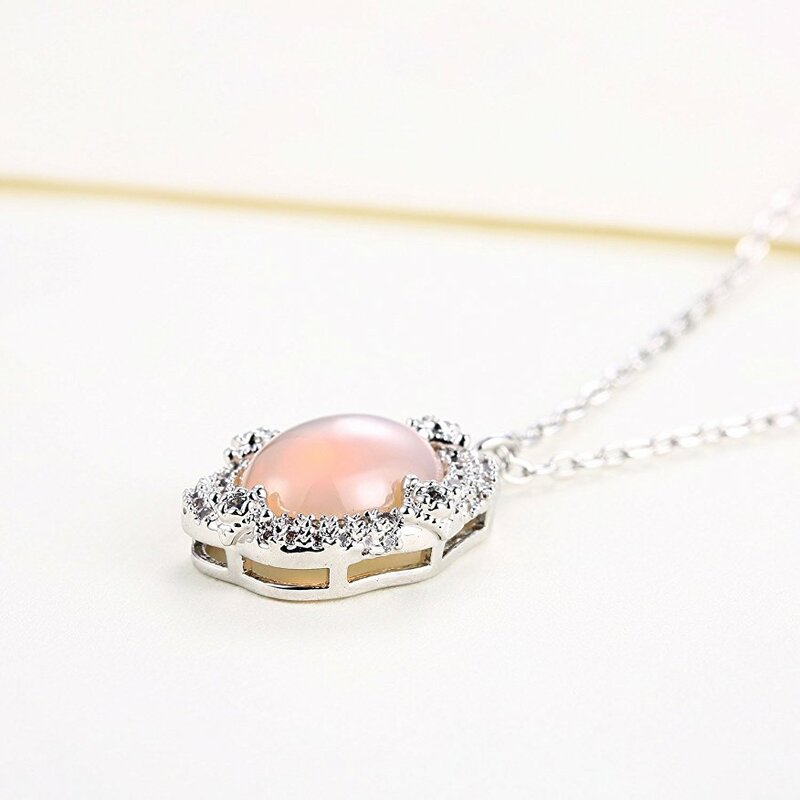 If she channels all things girlie, Barbie and Elle Woods all rolled into one, the gal who loves pink will adore the Caperci Natural Pink Opal Pavé CZ Frame Necklace in Sterling Silver. It is 18″ and is $42.99. ABOUT HER: YOUR EXOTIC FRIEND, or the friend who loves something distinctive, setting them apart from the crowd. 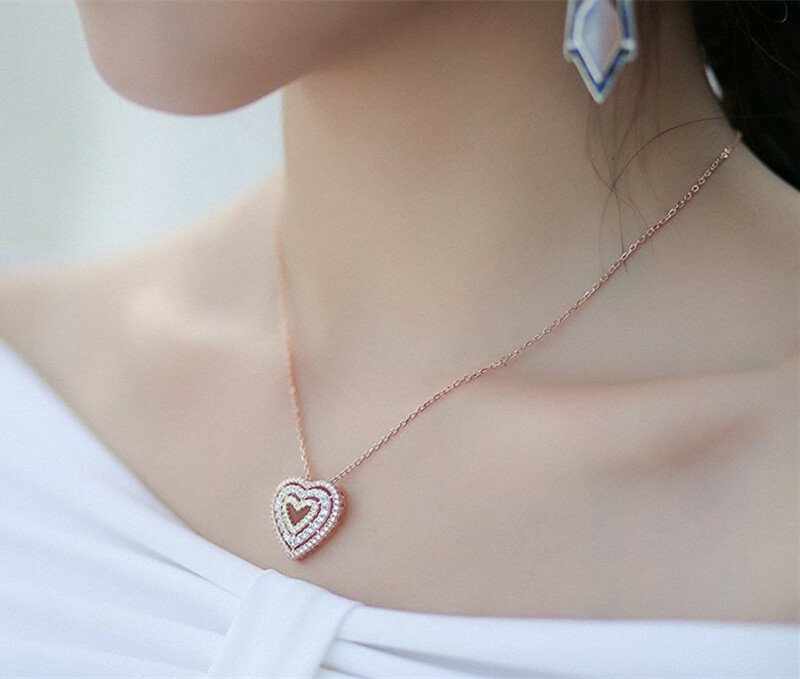 Two ways to let your loved one know you think she is special are giving her a distinctive piece of jewelry, or a personalized piece that holds a special detail about her. 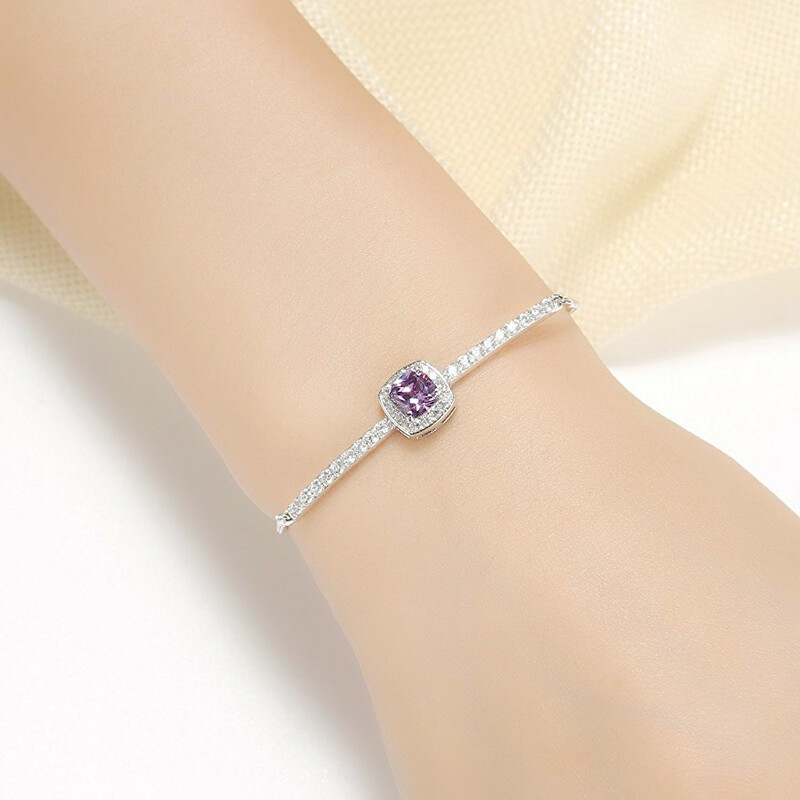 UNIQUE PIECE: A unique bolo bracelet has simple lines with a delicate color gemstone that is big on style. 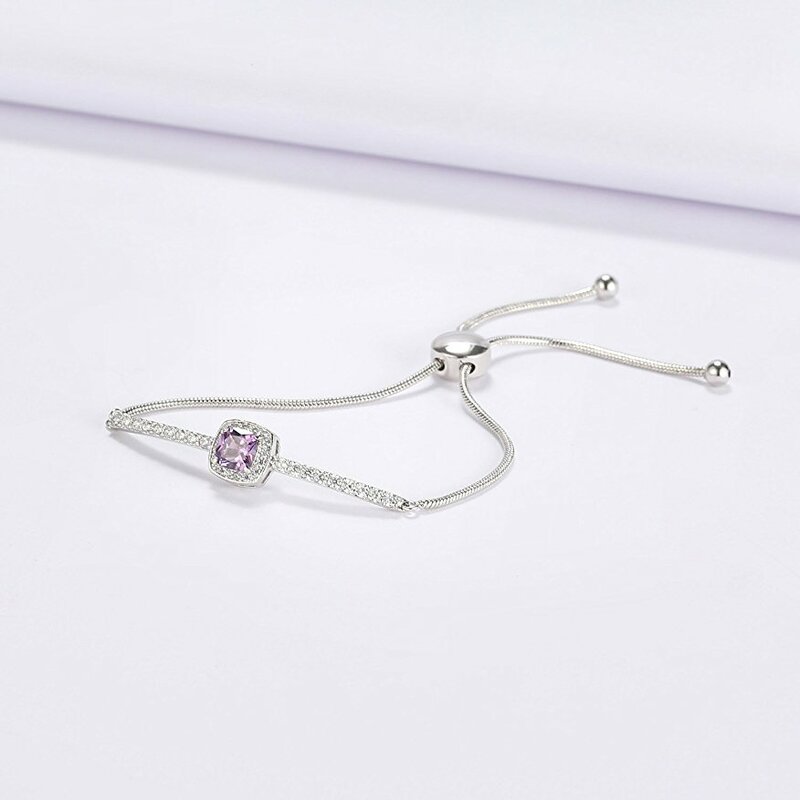 The adjustable nature of this piece allows for varying wrist sizes (think a gift for a pregnant friend that she can wear now and it will still fit after the baby is born), GuqiGuli Cushion Cut Created Amethyst and Created White Sapphire Frame Bolo Bracelet in Sterling Silver or in created blue Sapphire. 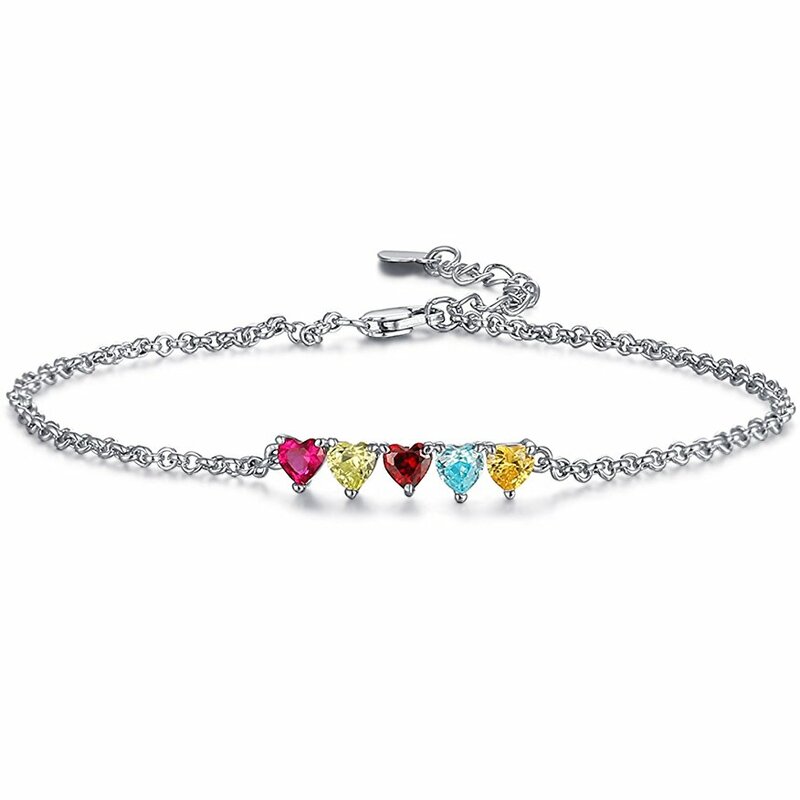 The bracelet is 9″ long and is quite a distinctive piece. It sells for $32.99. 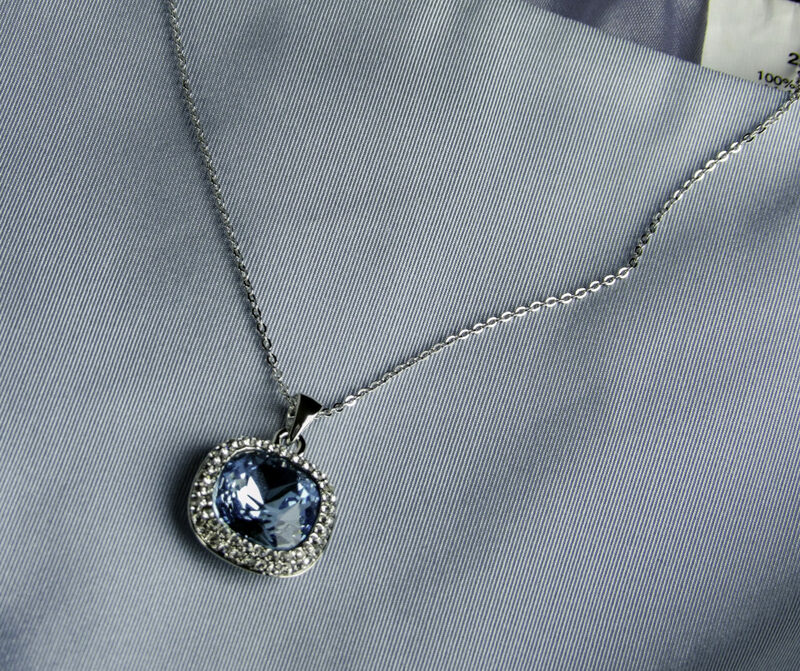 Close up of the detail, seen here in the Sapphire version. I think this one is my favorite! Does your friend love SIMPLE LINES and has an eye for detail? An architect major, a Romance Language Lover who enjoys the classics, symbols, or codices and mathematics? 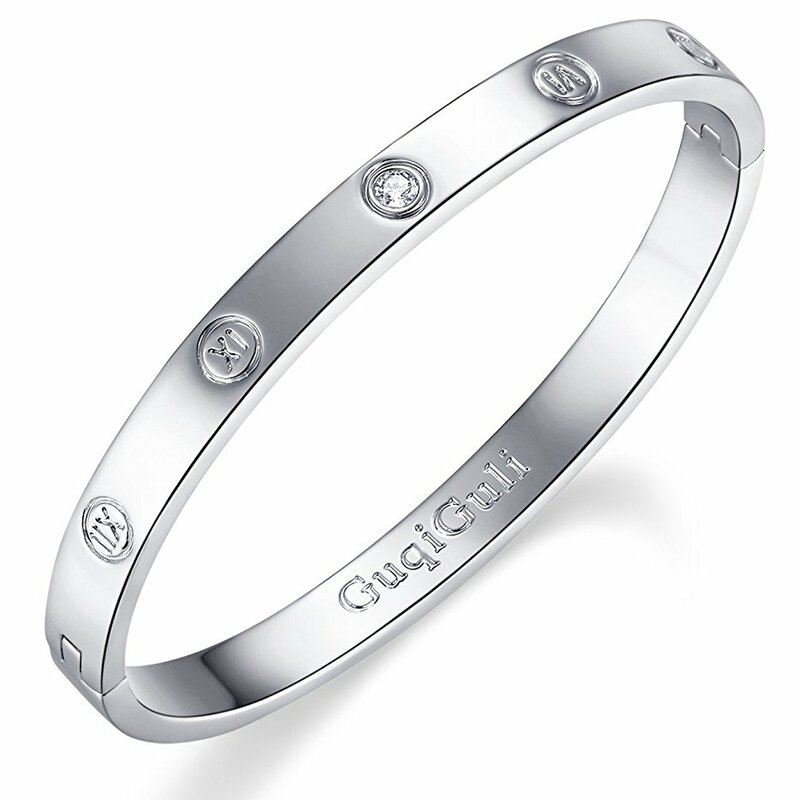 For a simple design with unexpected detail, try the understated bangle that can dress up with a little black dress or wear casually with a button down shirt, try the GuqiGuli Idiom Bangle Collection Rome Number Set In Stone Hinged Bangle, 7.5”. 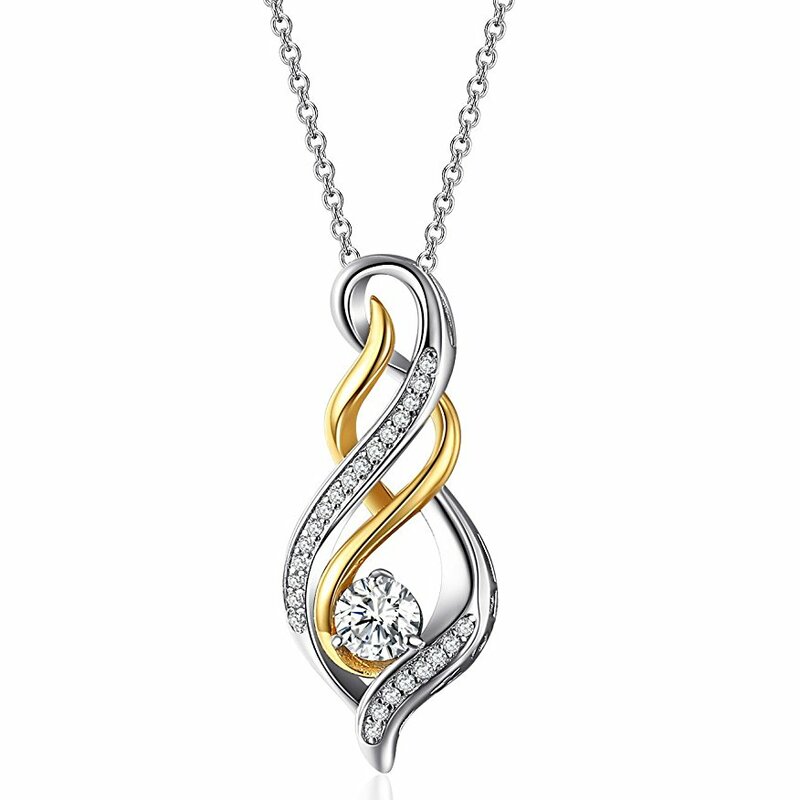 At $29.99, it comes in your choice of Yellow Gold Plate, White Gold Plate, Rose Gold Plate, to best suit her tastes. 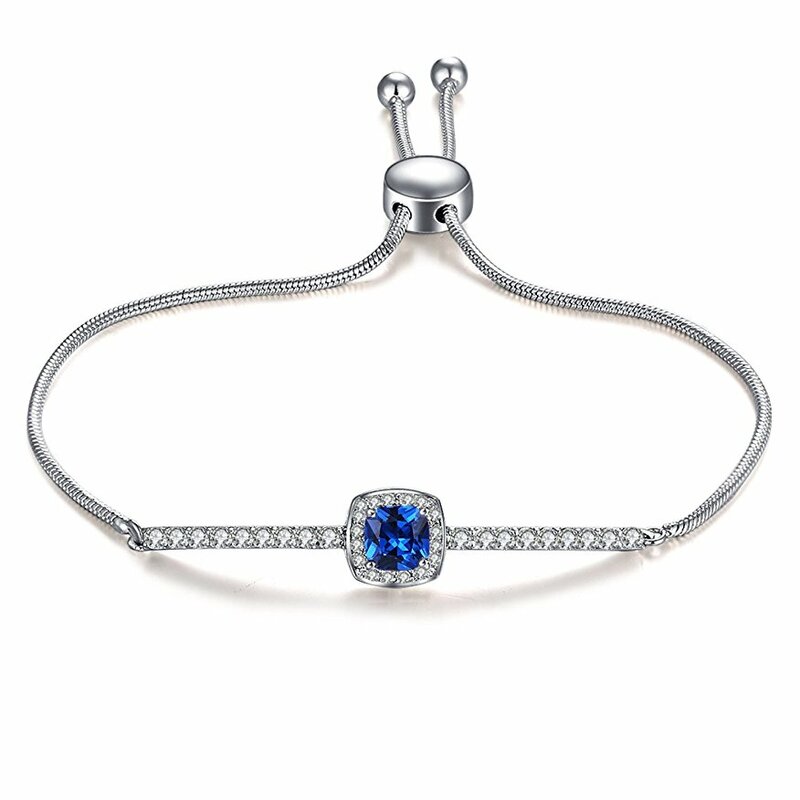 Something of a Classic Tiffany’s sort of vibe, the Vibrille Created White Sapphire XO Bracelet in White Gold Plated Sterling Silver, 7.5”. There is an optional Rose Gold Plate (as seen below at the right) if your friend prefers a more colorful look. It sells for $41.99. 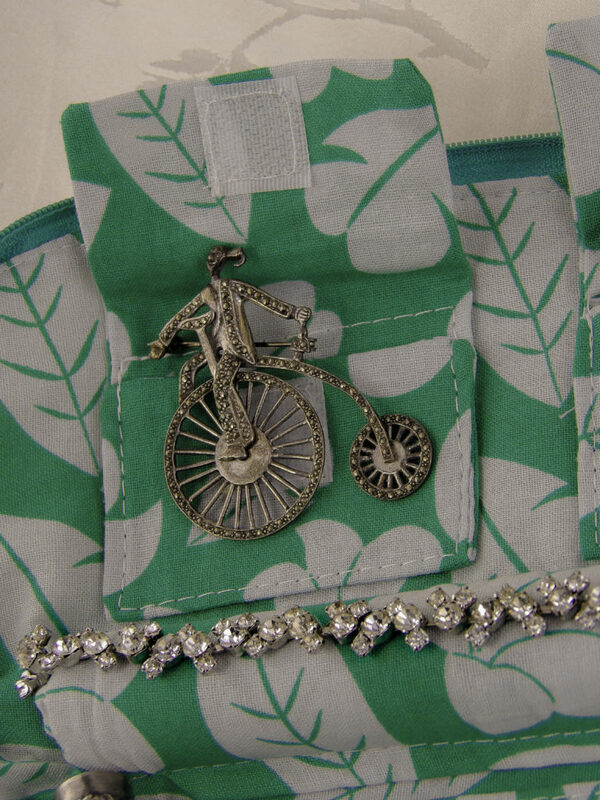 How about earrings for someone who likes some adornment, but not too much? 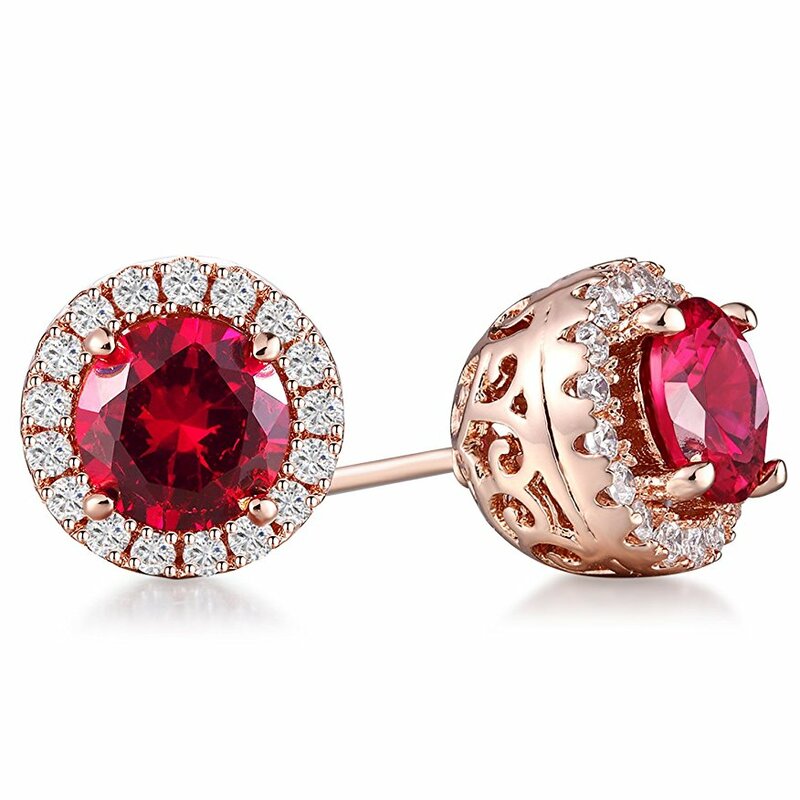 For a friend who likes to wear an overall classic look but with a hint of shimmer and bling, consider the Vibrille 6mm Round Cut Created Ruby & CZ Pavé Halo Stud Earrings in Rose Gold Plated Sterling Silver, or with Created Blue Sapphire & White Gold Plating for $26.99. Know a lady who loves to shine? She is sure to stand out with these Caperci Natural Pink Opal & Pavé Created Blue & Black Sapphire Chandelier Earrings in Sterling Silver. 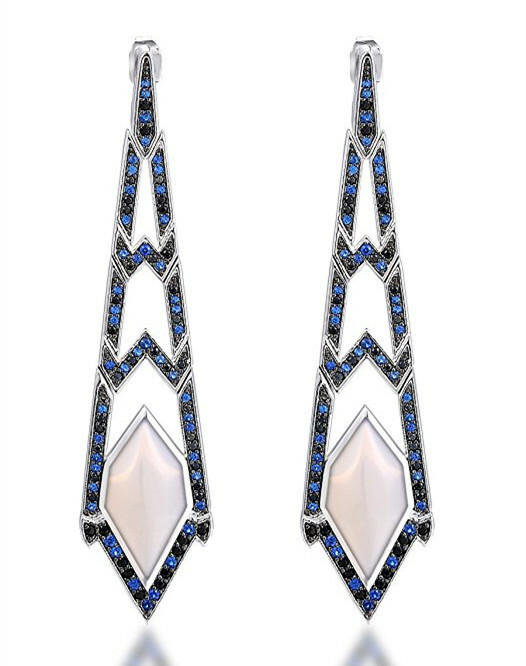 These elaborately crafted dangle earrings have a pink natural opal stone, a black spinel and lab created blue sapphire for a unique piece that is sure to grab attention. 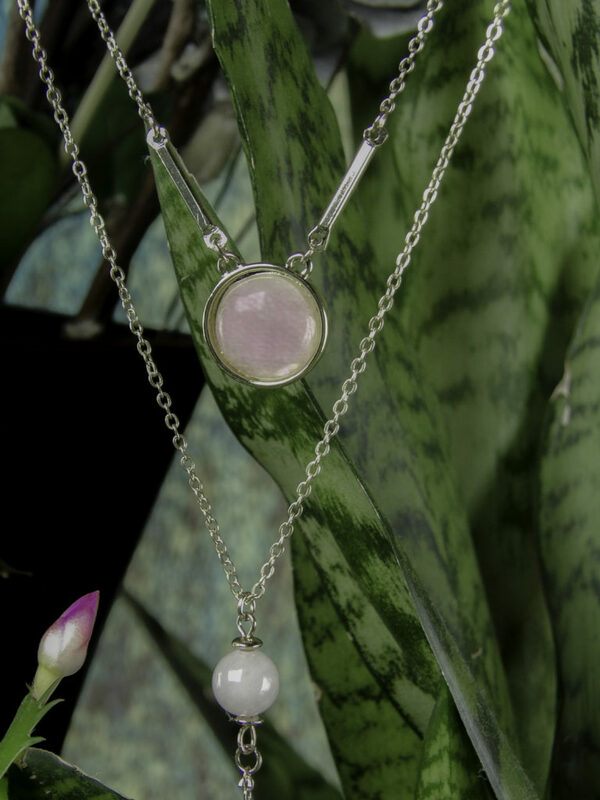 Inlaid stones in sterling frames, the are 6.5cm long and the opal focal piece is almost a cm. This set sells for $65 and comes with a very nice jewelry box. There is also the option of a natural green opal instead of the pink. 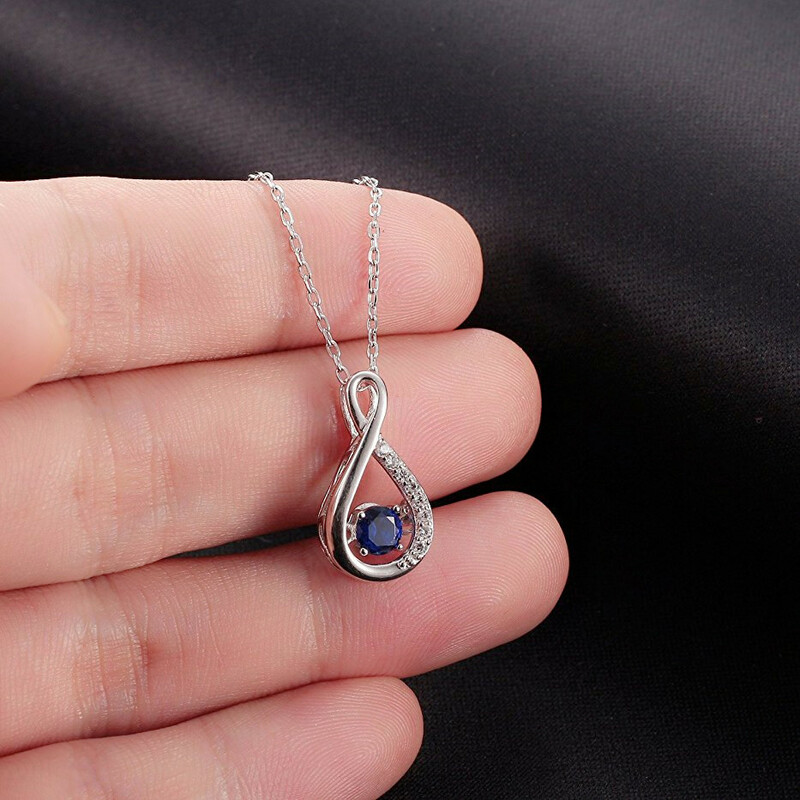 For the friend who prefers bolder colors and design shapes, Caperci Created Sapphire & CZ Pavé Infinity Necklace in Sterling Silver features a Blue Sapphire or White Sapphire along with smaller stones on an 18-inch chain. It sells for $26.99. Want a Sentimental Gift for Mom? 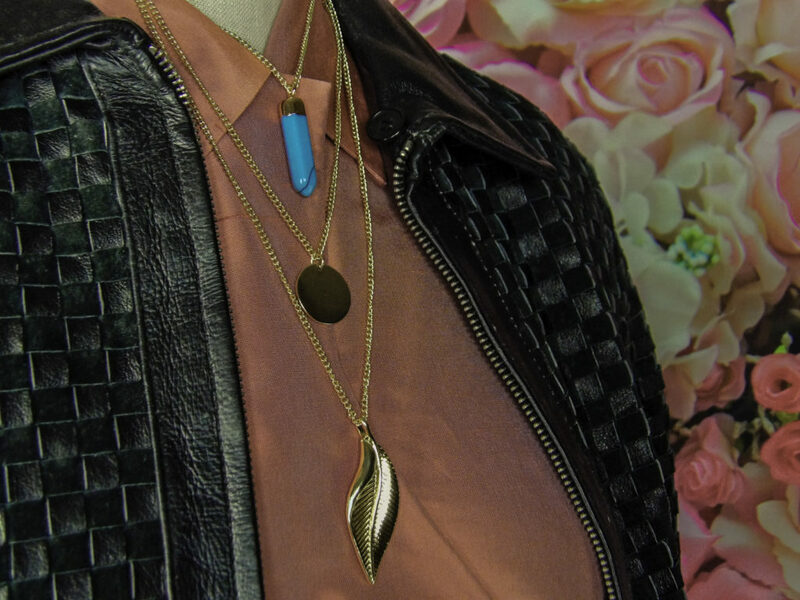 Here are nine great options including eight necklaces and a bolo bracelet. These Caperci pieces all come with a gift box and satisfaction guarantee. 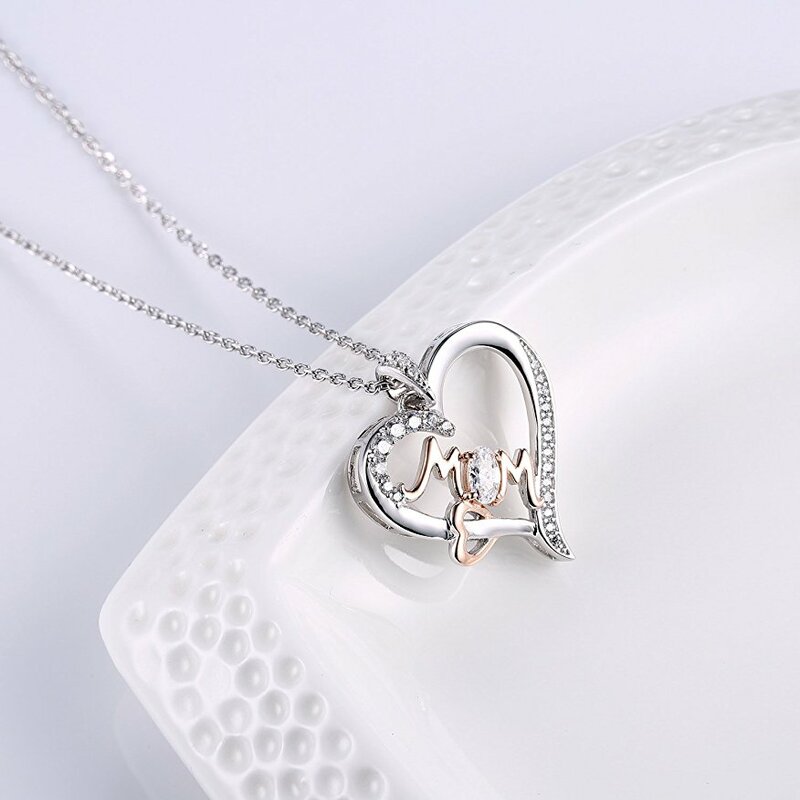 Caperci Heart Cut CZ Rose Gold Plated “MOM” Pavé CZ Dancing Heart Necklace, is 18″, this slanted heart with smaller Cubic Zirconia side stones is an open piece with Cubic Zirconia for the letter ‘O’ in MOM. It sells for $24.99. 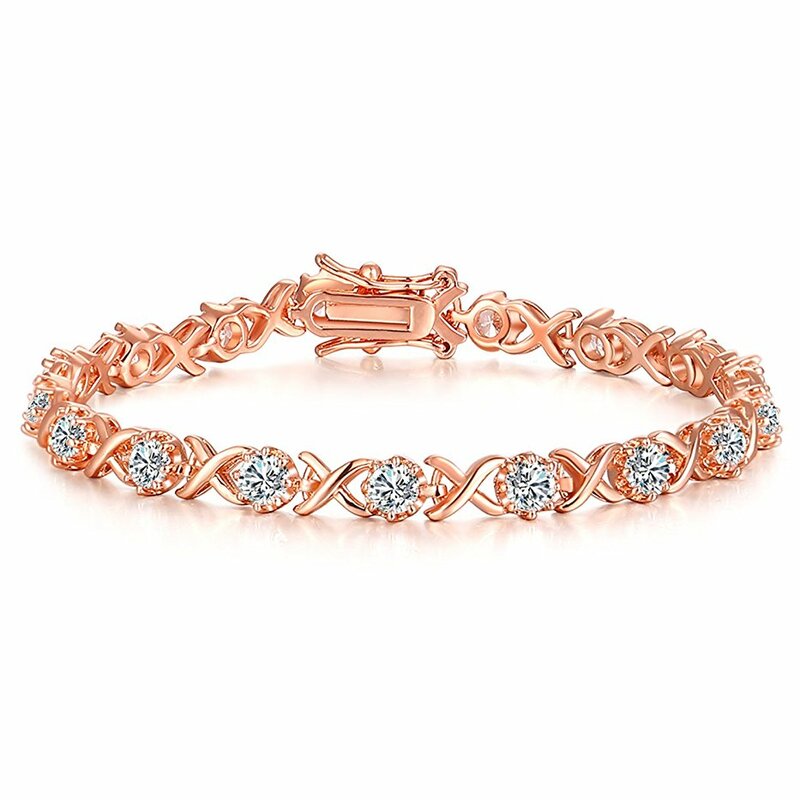 Caperci Rose Gold Plated Double Love Created Blue Sapphire & CZ Pavé “Mom” Bolo Bracelet, 9″. $29.99. 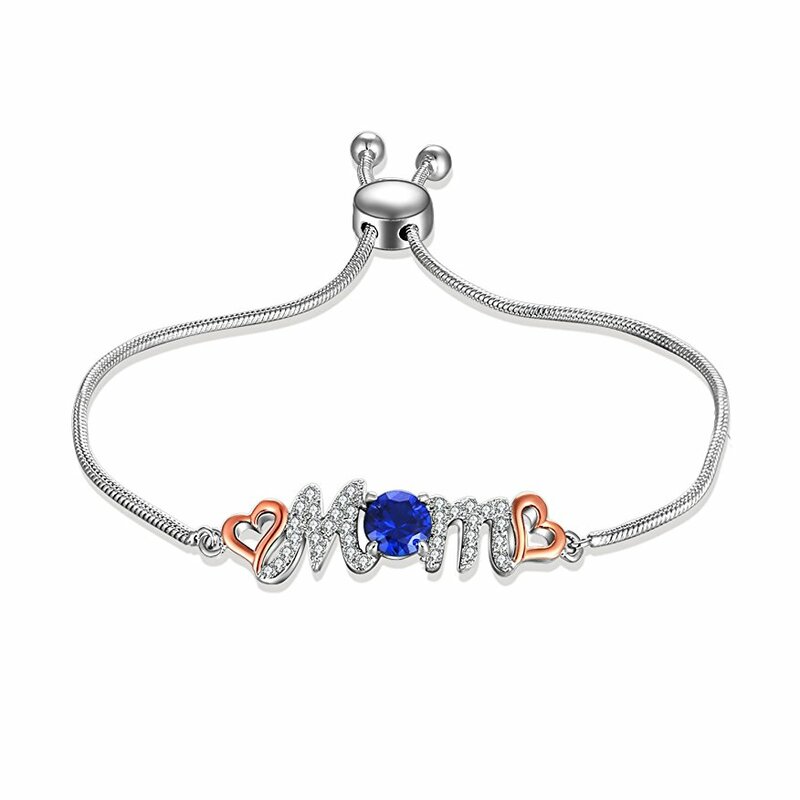 Bolo Mom Bracelet with double hearts, pave letter M’s and a blue Sapphire O. 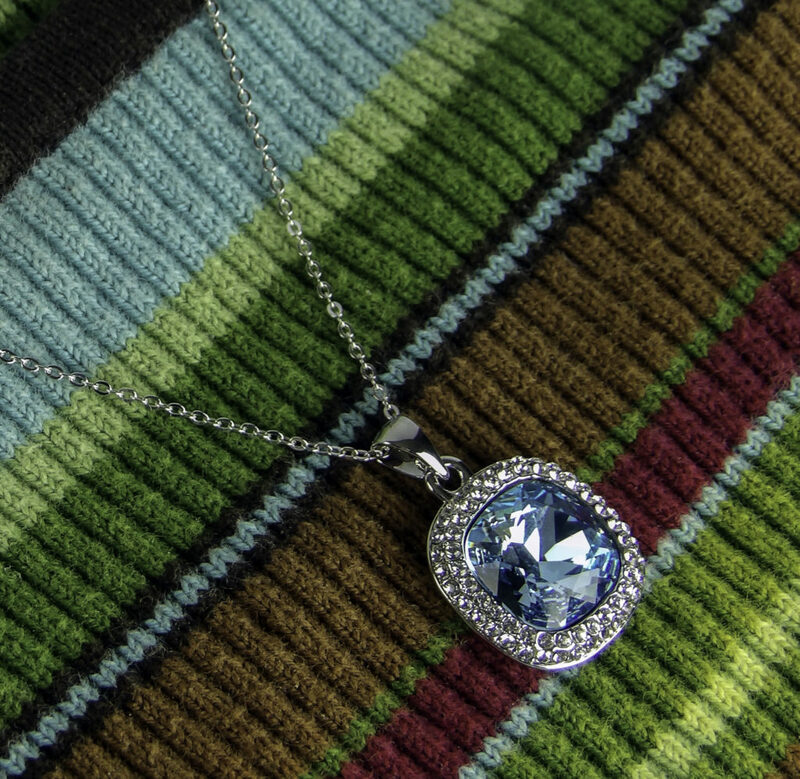 The Sapphire has wonderful luster and sparkle! 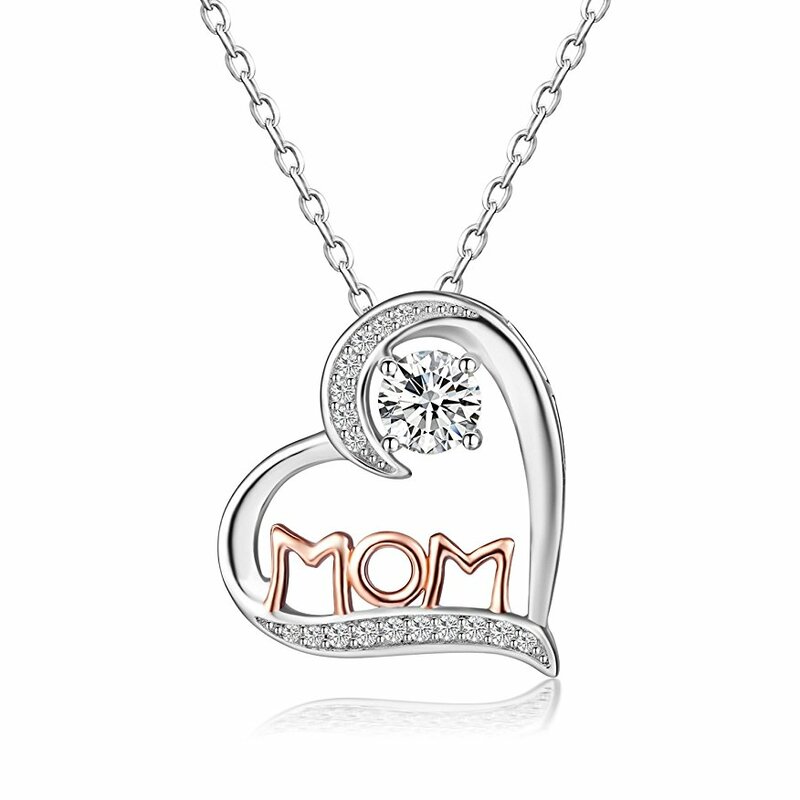 Caperci Rose Gold Plated MOM & LOVE Pavé CZ Heart Necklace, 18″. $32.99. 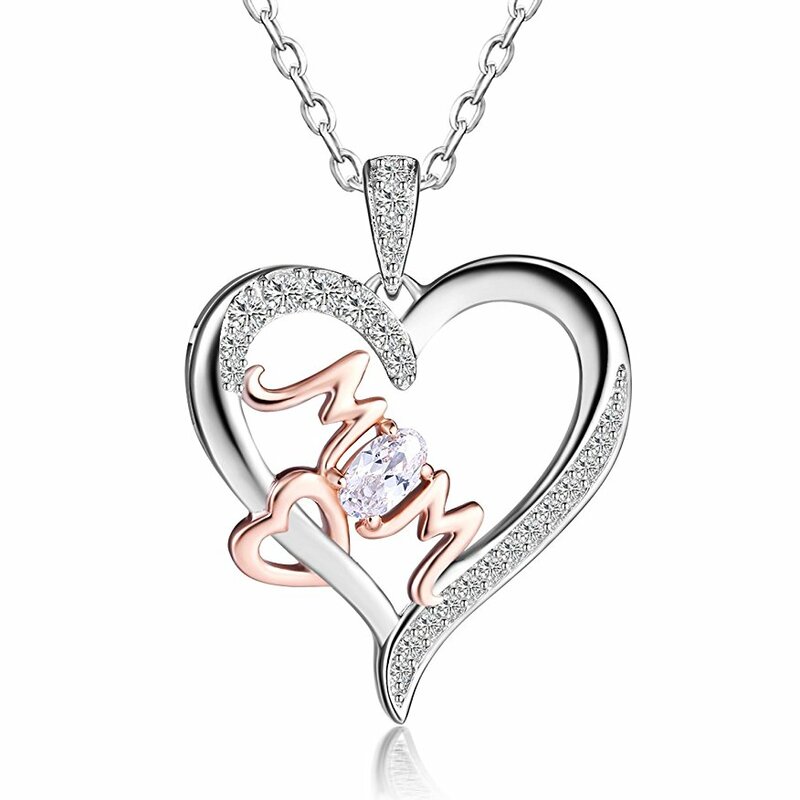 Foruiston Round Cut CZ & Rose Gold Plated MOM Tilted Heart Necklace, 18″. $29.99. GuqiGuli Round Cut CZ & Rose Gold Plated MOM Double Tilted Heart Necklace, 18″. $31.99. 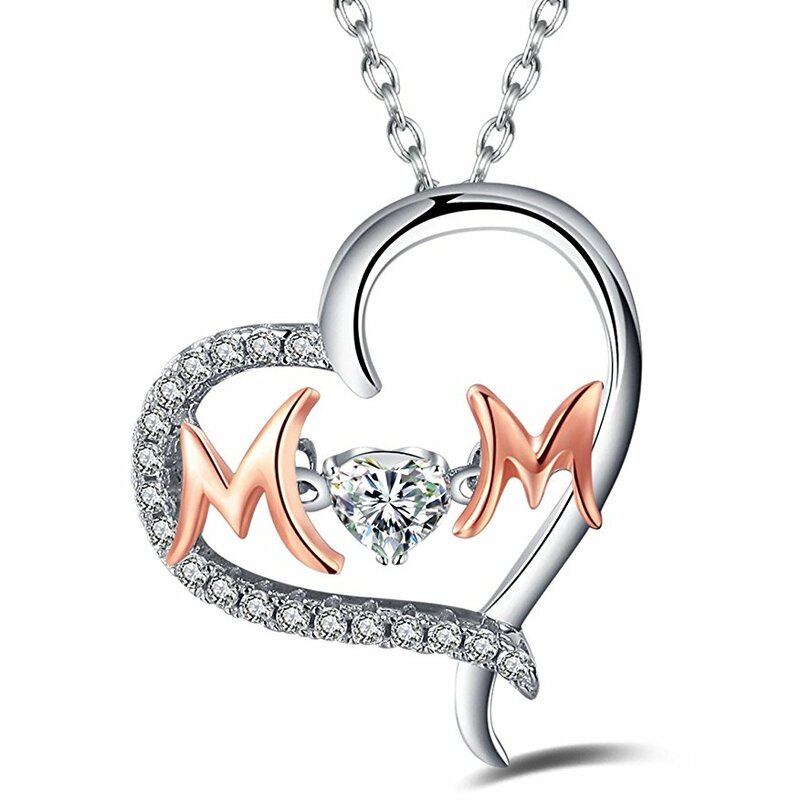 Vibrille Oval Cut CZ Rose Gold Plated MOM & LOVE Heart Necklace, 18″. $30.99. That’s our list of jewelry gift ideas for all the ladies on your list! All made of sturdy construction, your gift will be remembered for years to come. Find each of these pieces at Amazon, ready to ship and arrive with time to spare! Style Chicks received compensation for our unbiased review, time and effort to compile this list. However, the opinions expressed are 100% ours. 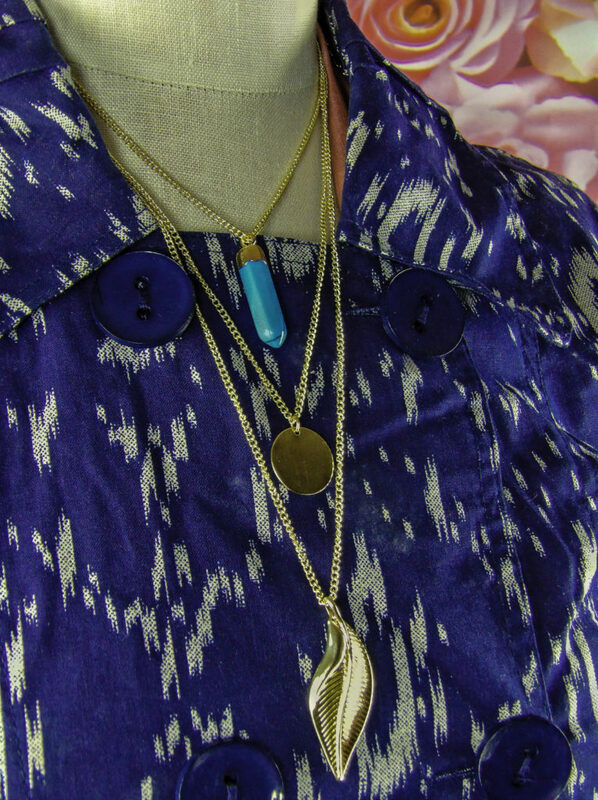 Love to wear long or multi-tiered necklaces? 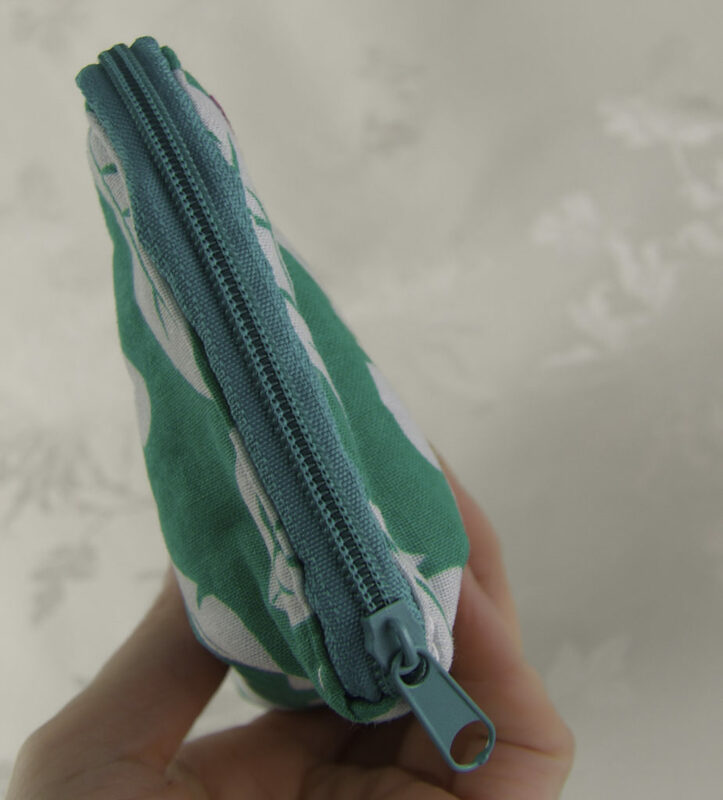 Have a handmade, delicate or heirloom piece you want to keep free of tangles and scratches while traveling? 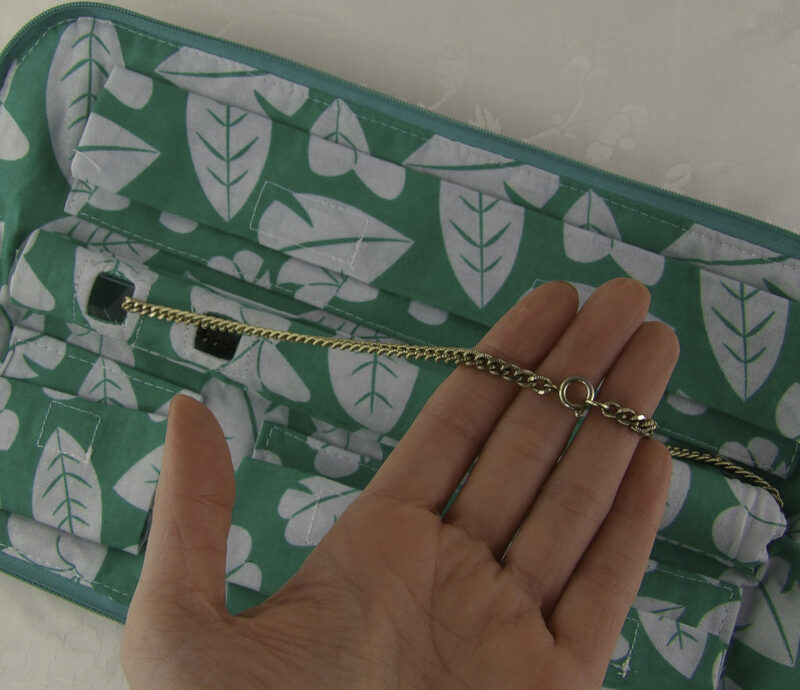 Whether you’re traveling for a destination wedding, business trip, or just as a space-saving home solution at home, the No Knot Necklace Jewelry Carrier keeps your jewelry safe and tangle free. 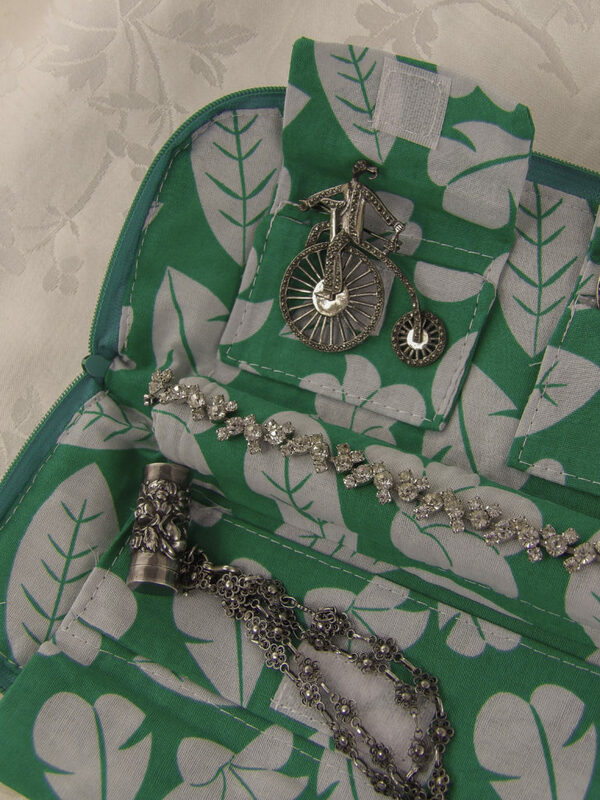 The No Knot Necklace Carrier is a space saving jewelry storage solution for travel and home. Its’ award-winning patented design won the 2015 InventHelp ® Gold Merit Award. 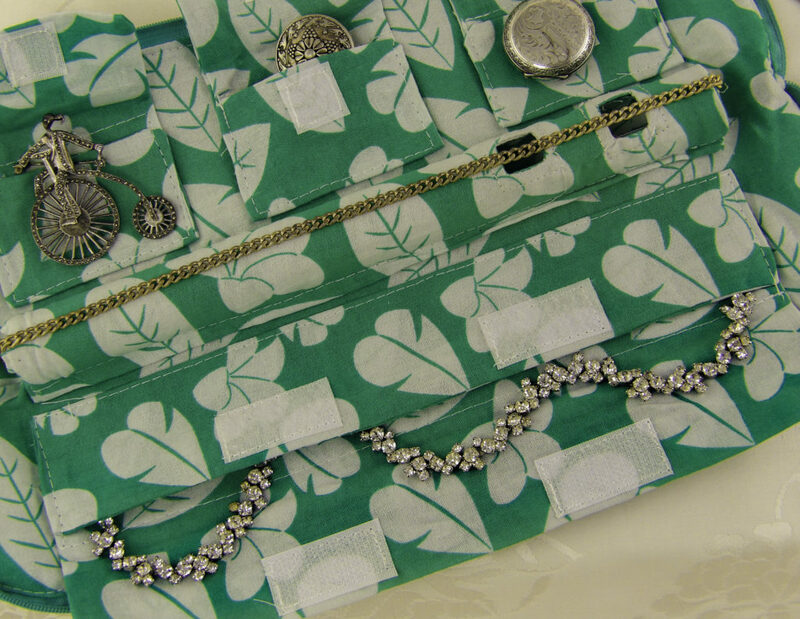 No Knot holds various jewelry pieces in padded compartments including storage space for multiple necklaces ranging from 15 to 24 inches long. 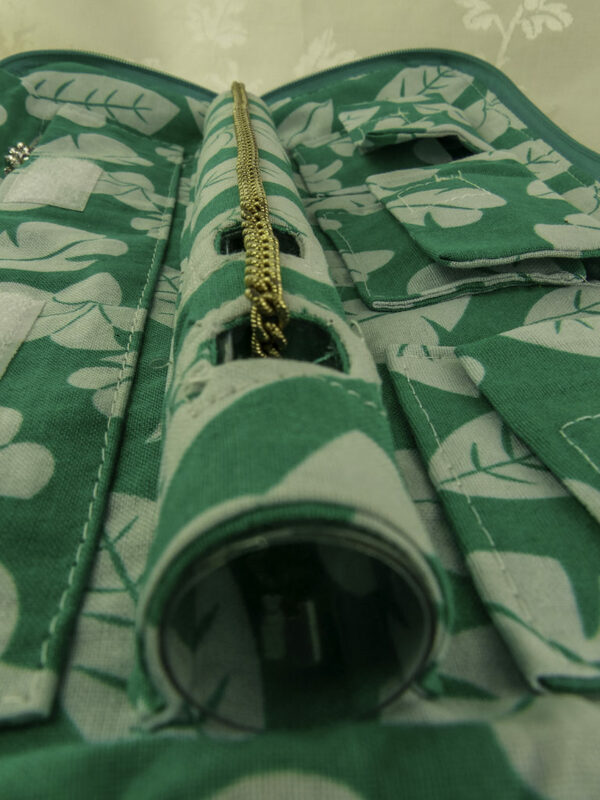 Cloth folded carrier with an outside decorative pattern. 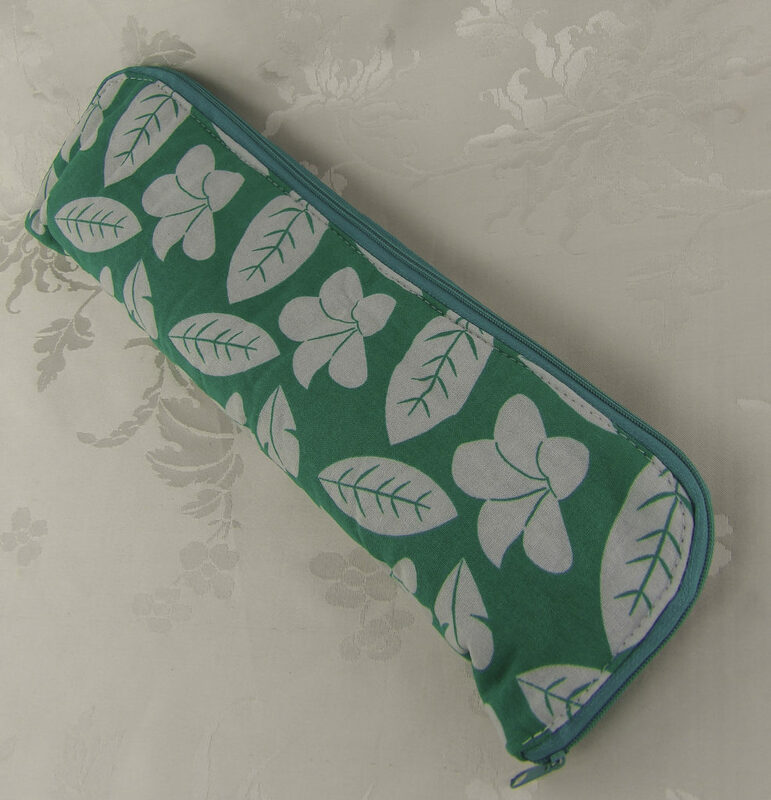 The pattern seen here is “Tropical Vacation” a bright teal green with a white leaf tropical pattern and aqua blue border, but it also comes in red cherry blossoms on a tiffany aqua blue background, as well as a black and silver gray geometric pattern. 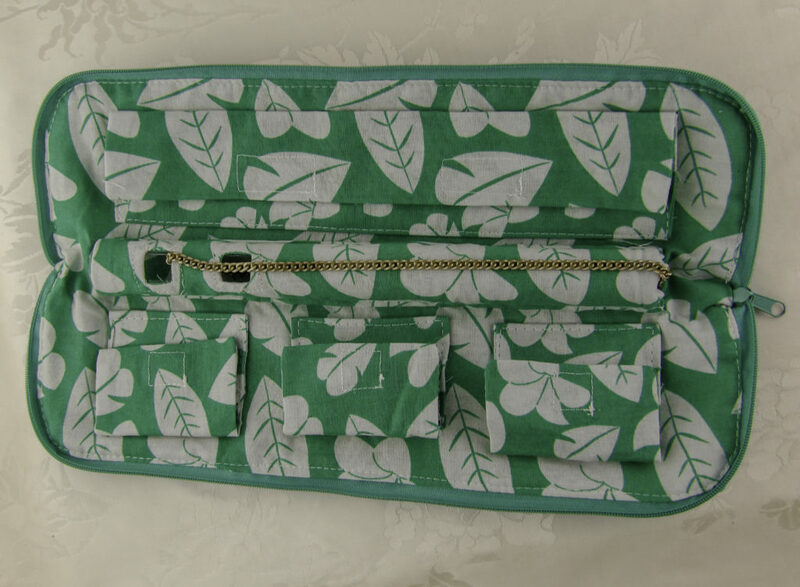 The No Knot Necklace Jewelry Carrier folds lengthwise to encase two rows of padded pockets. 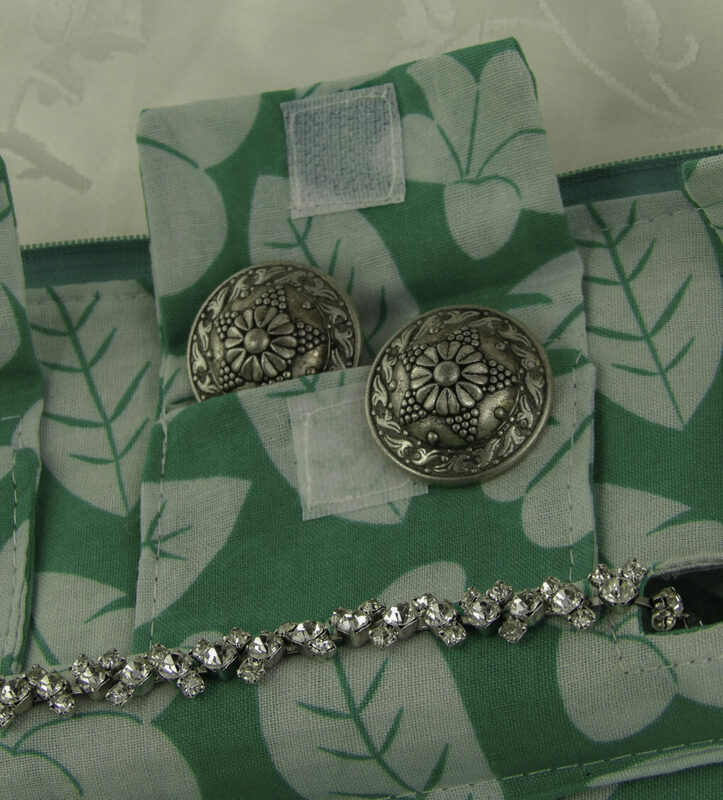 One row has two small deep pockets for earrings, rings, pins, clips, and brooches. 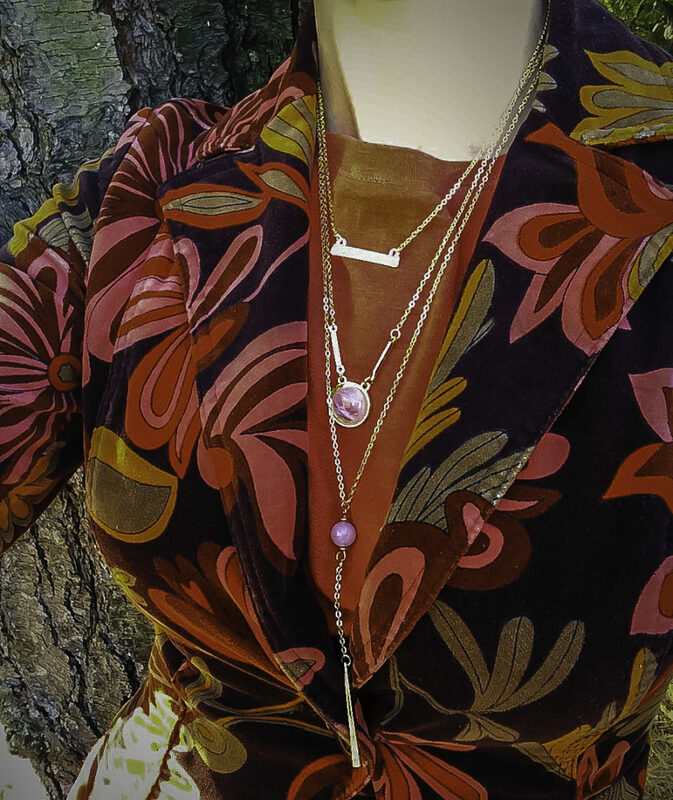 Use the long pocket to hold chains longer than 24 inches, such as this vintage Sterling necklace with a large but delicate focal piece at the end of the drop. 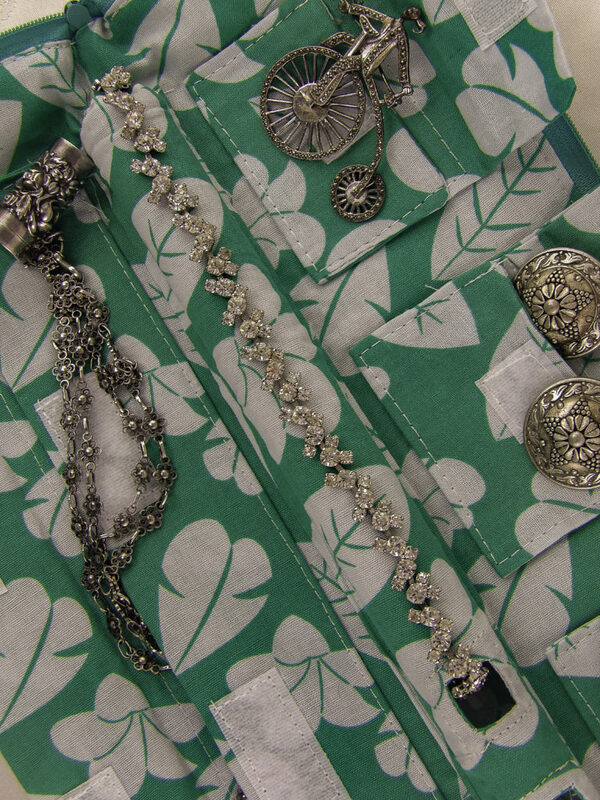 The center has an innovative compartment the loops each necklace in the safe padded compartment to keep it from tangling up upon itself or other necklaces. 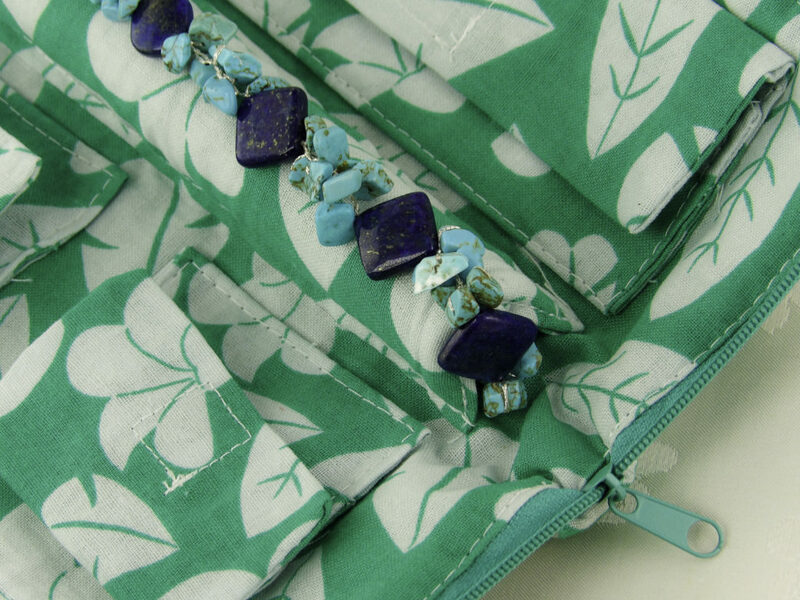 By looping the necklace or necklaces in this compartment, it not only keeps it tangle-free but the soft padding keeps focal pieces or gemstones safe from scratches or damage and away from other necklaces. 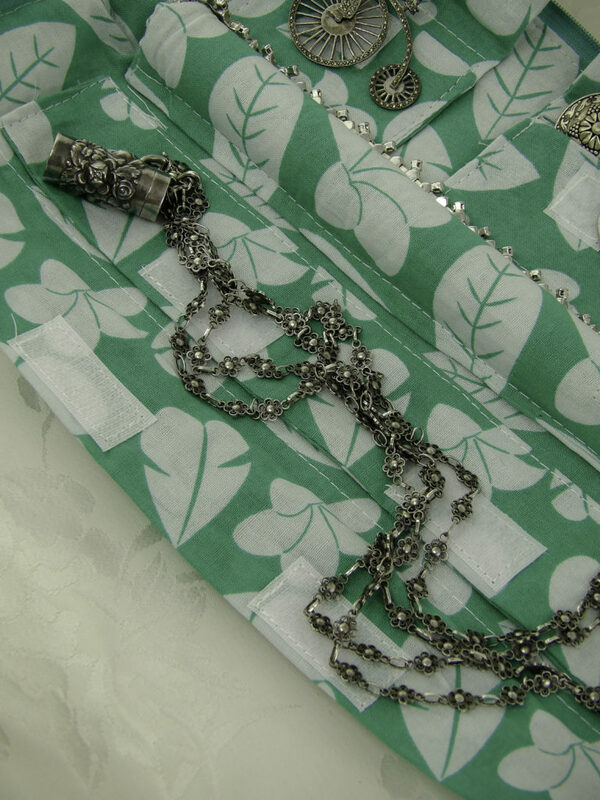 STEP TWO: Feed the necklace down the length of the compartment until it comes out the other end. Done! 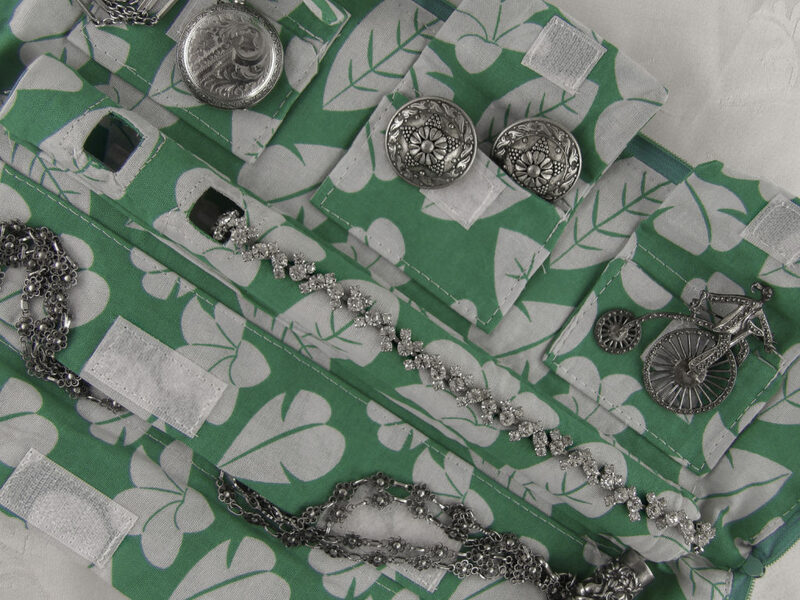 The No Knot can hold multiple necklaces at once and still keep them tangle free. Beaded and handmade jewelry can be delicate and not necessarily fit into a drawstring bag due to the size of the beads. 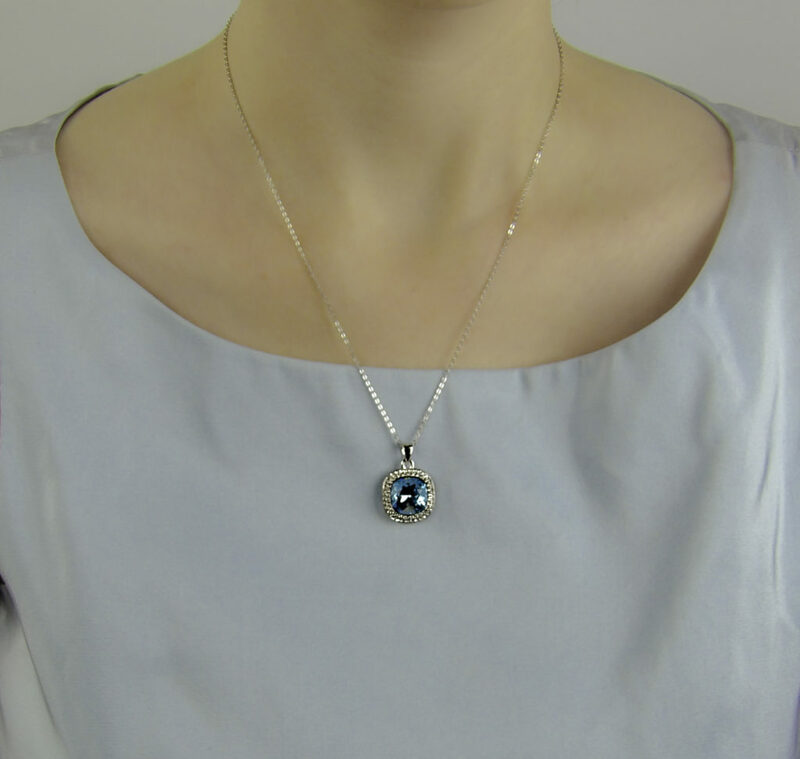 But handmade necklaces, such as this piece, fit perfectly onto the No Knot without damaging the threadwork or beading. 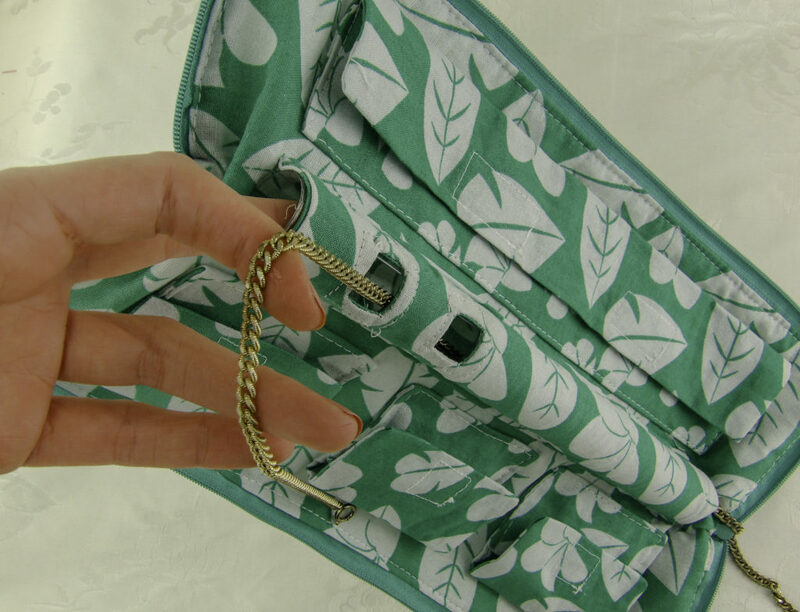 While ideal for carrying jewelry while traveling, No Knot fits nicely into a handbag, suitcase, gym bag, overnight bag, or as storage in a dresser or vanity drawer. The discrete size and shape of the No Knot make it easy to have your jewelry with you at all times if you prefer to keep valuables with you instead of leaving them in a hotel room or in the hotel vault. Another use I found for the No Knot Necklace Carrier Jewelry Carrier is keeping jewelry in a safety deposit box. 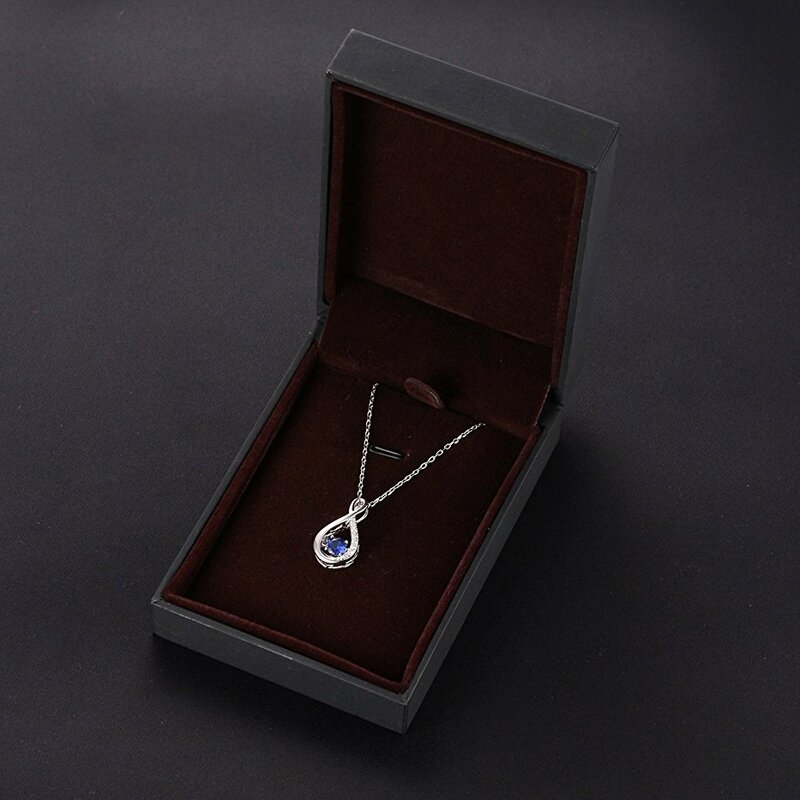 Most of the smaller safety deposit boxes are too narrow or short to hold the original gift box for a necklace, which makes it tempting to put valuable necklaces in a less safe container than the original gift box for storage. 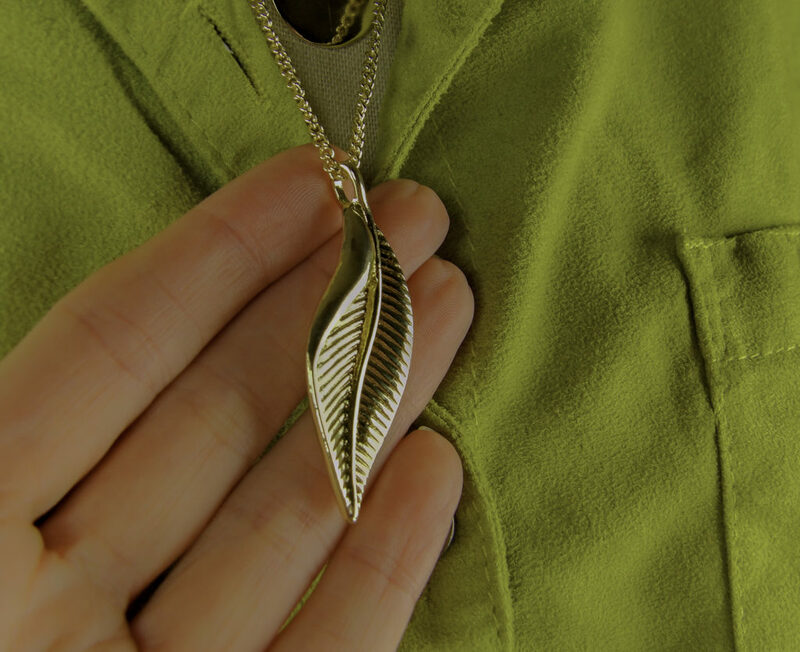 This can subject the necklace to scratches and damage. 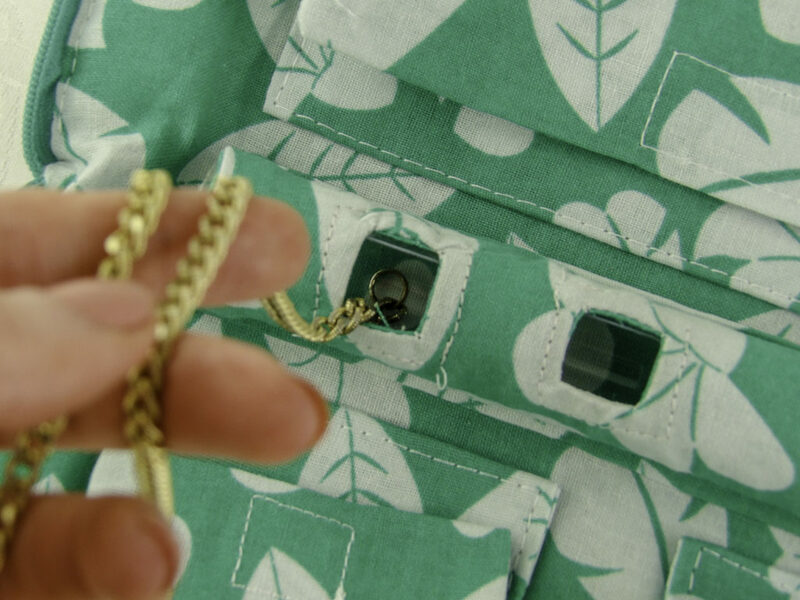 The No Knot not only fits in a small safety deposit box, but it keeps family jewelry securely packed without scratches or tangling even in a smaller safety deposit box. It is well made of strong weave, padded material and sturdy construction with impeccable stitching. 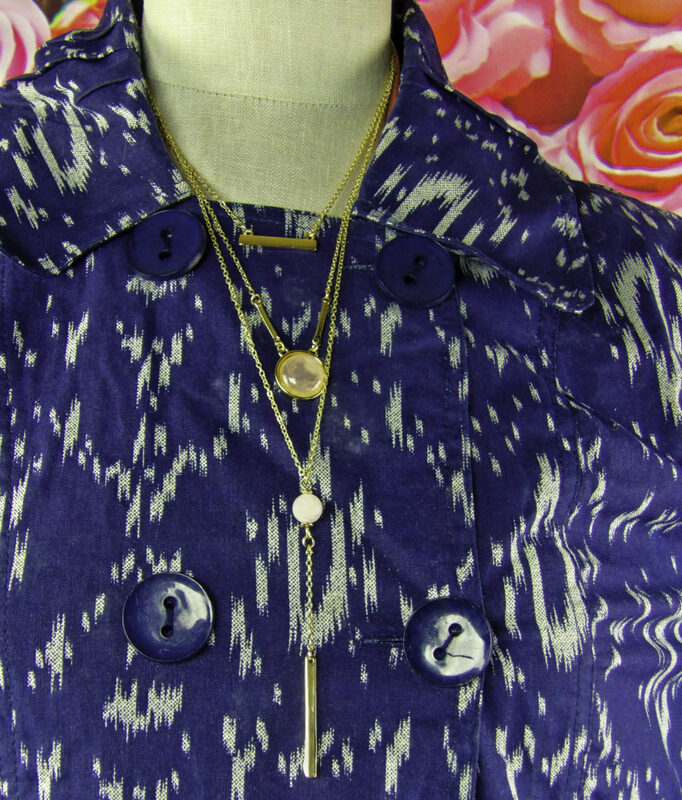 It is very easy to loop the necklaces into place, and it works very well. When I first heard about No Knot, two necklaces immediately came to mind. 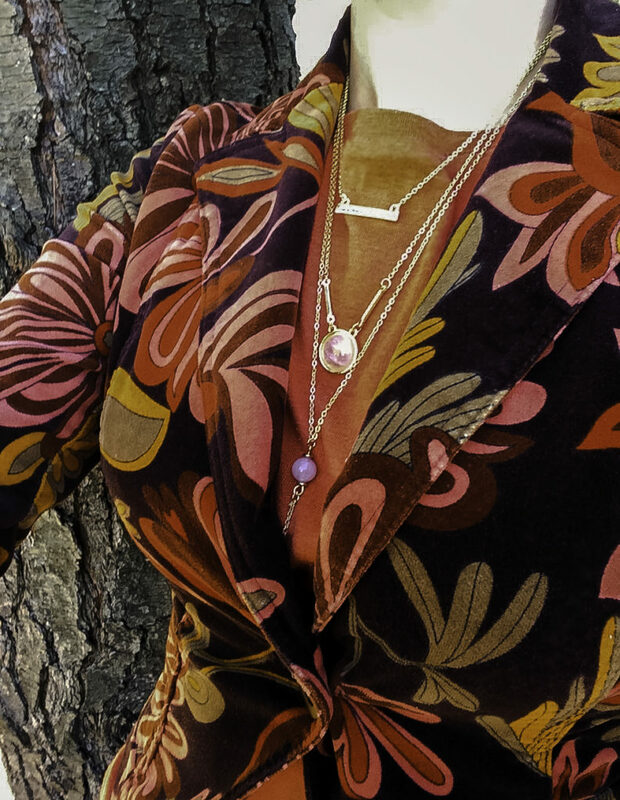 One is my grandmother’s diamond necklace that typically only comes out for special occasions and the other is a modern necklace that has lots of extended hanging adornments that always get entangled onto itself. Both necklaces remained tangle-free in the No Knot. 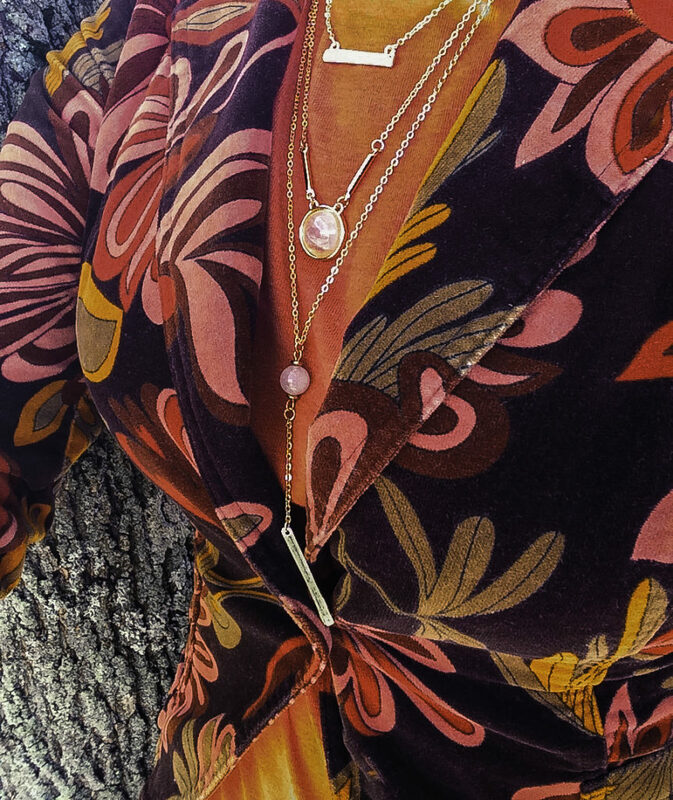 Trying other necklaces, it easily holds necklaces of various lengths from chokers to longer chains without tangling and my focal pieces stayed protected and scratch-free. 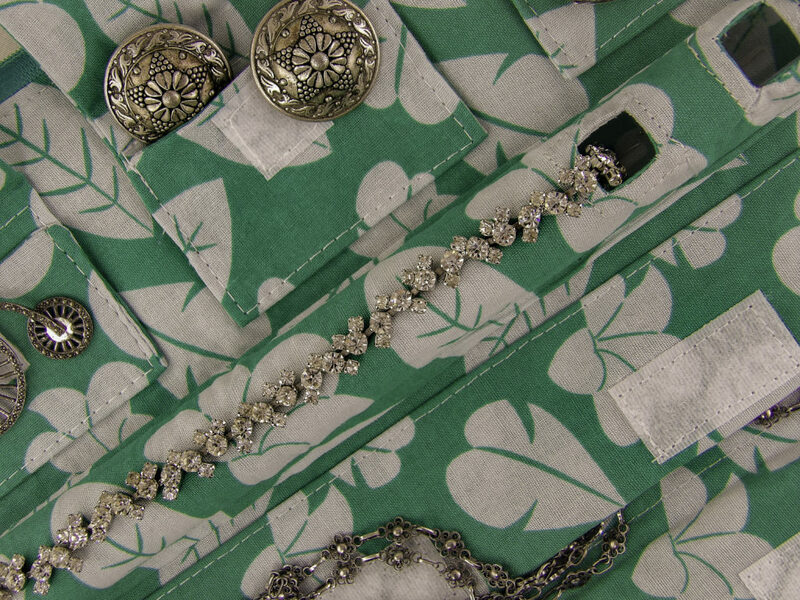 Rings, pins, cufflinks, and earrings and other jewelry fit easily into the small pockets, and the long pocket held chain bracelets and bangles. Do you know a bride with an upcoming destination wedding? A frequent traveler? 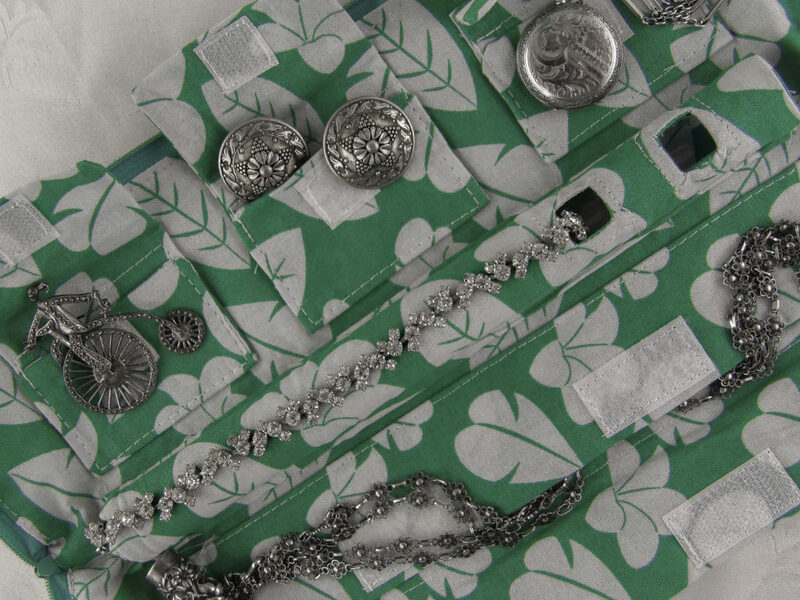 A super-organized jewelry lover? Someone who makes and wears their own beaded jewelry? No Knot makes a great gift. 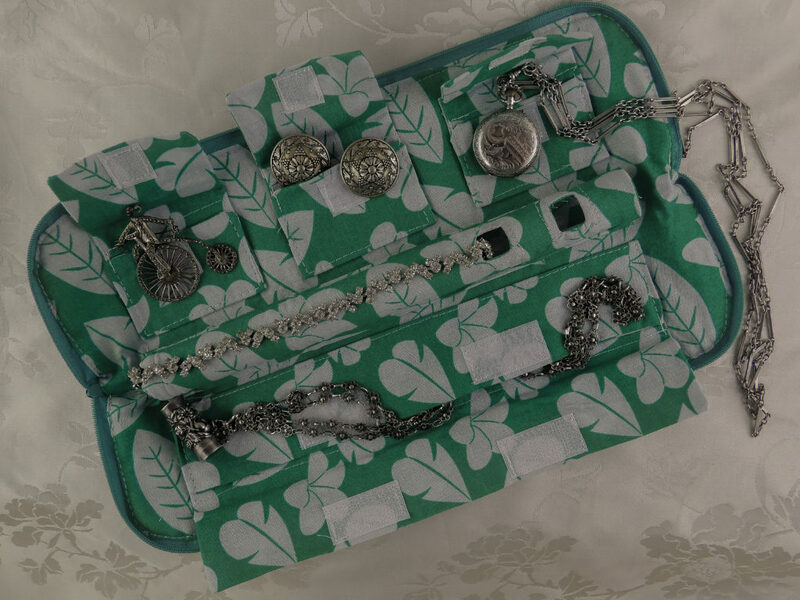 The No Knot Necklace Carrier Jewelry Carrier is an attractive, convenient, innovative way to keep your necklaces tangle-free, scratch free and safe while traveling or stored at home. If you need to buy a gift for someone you don’t know someone well but have seen them wear jewelry, you can’t go wrong with the No Knot. 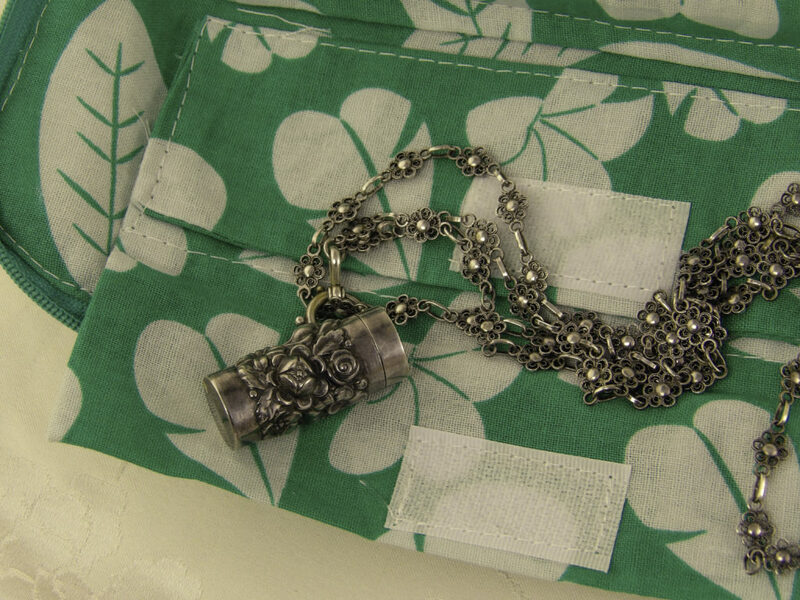 No Knot Necklace Carrier Jewelry Carrier keeps long necklaces tangle-free! Style Chicks received the No Knot Necklace Carrier Jewelry Carrier in exchange for our unbiased review and received compensation for our time and effort. However, our experience with the product and the opinions expressed in this review are 100% ours. 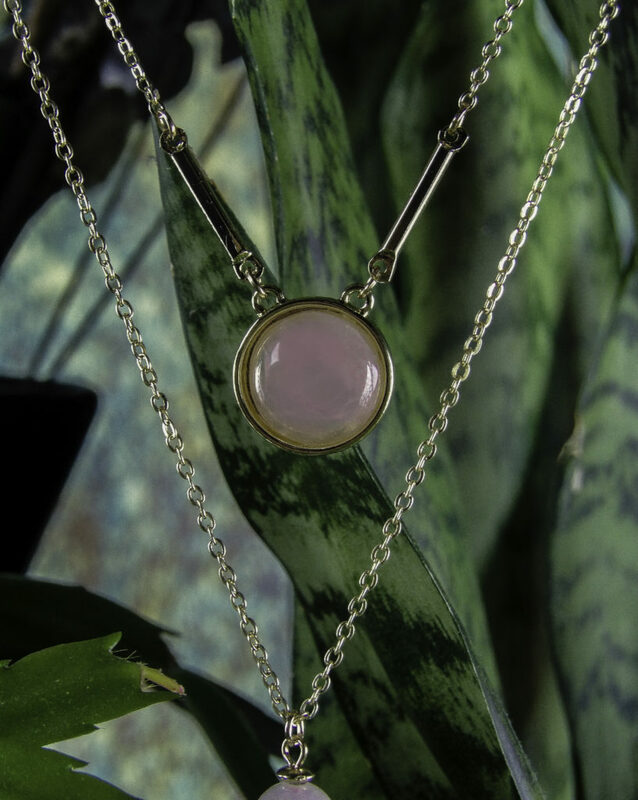 A delicate pink shade that works with spring, summer, and early autumn colors, this Rose Quartz Pendant has a middle necklace focal piece Rose Quartz medallion and a Rose Quartz smaller orb piece as a graduated link to a lariat style metal drop. Rose Quartz looks great with a variety of colors including silver gray, ice blue, plum, purples, pinks, blues, pastels, and brights. 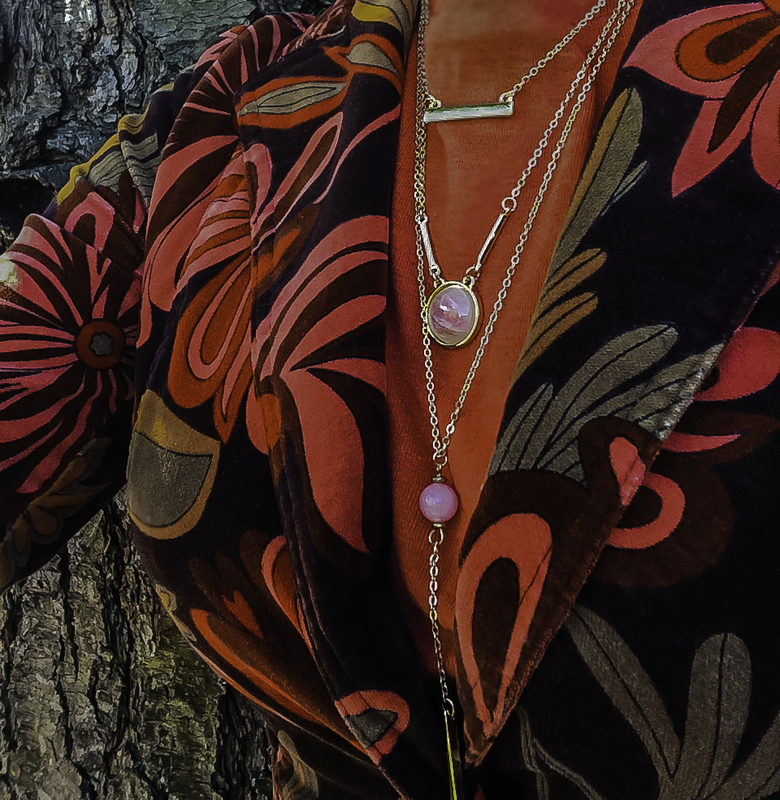 Here the Kisspat Rose Quartz Bar Multi-layer necklace it is paired with fall colors of a basic tee and blazer for a warm October day, but the universally flattering shade of Rose Quartz as seen in this necklace works with year-round color palettes whether spring pastels, summer brights, icy winter tones or autumnal shades. 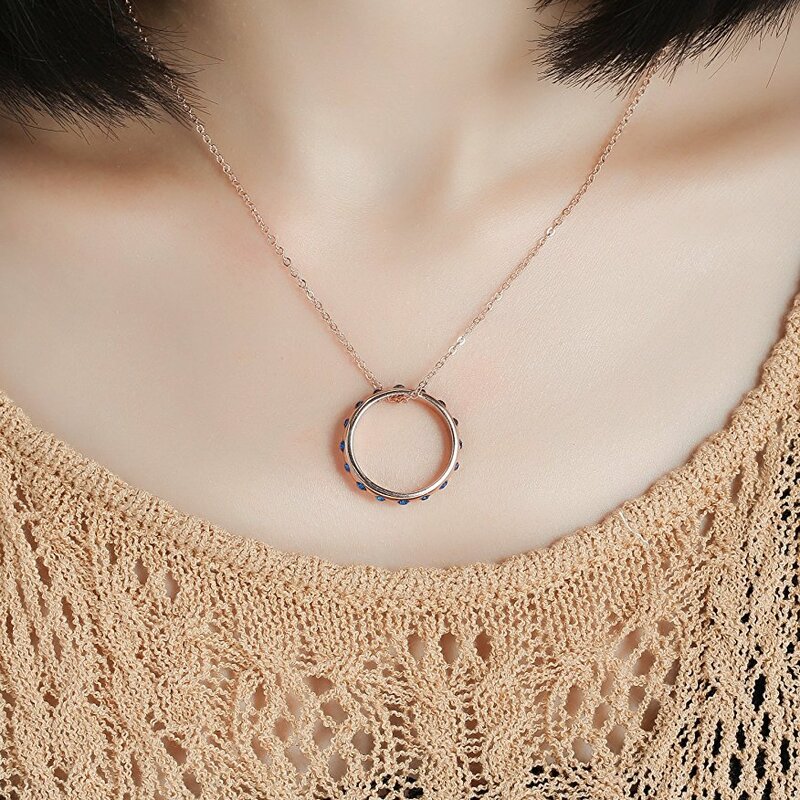 There are three layers to the necklace, each necklace chain is 24″ with a 2″ adjustable length to position the necklace where it is more flattering to your outfit or figure. I like adjustable lengths so that necklace detailing doesn’t clash against any clothing button placement or conflict with a neckline. 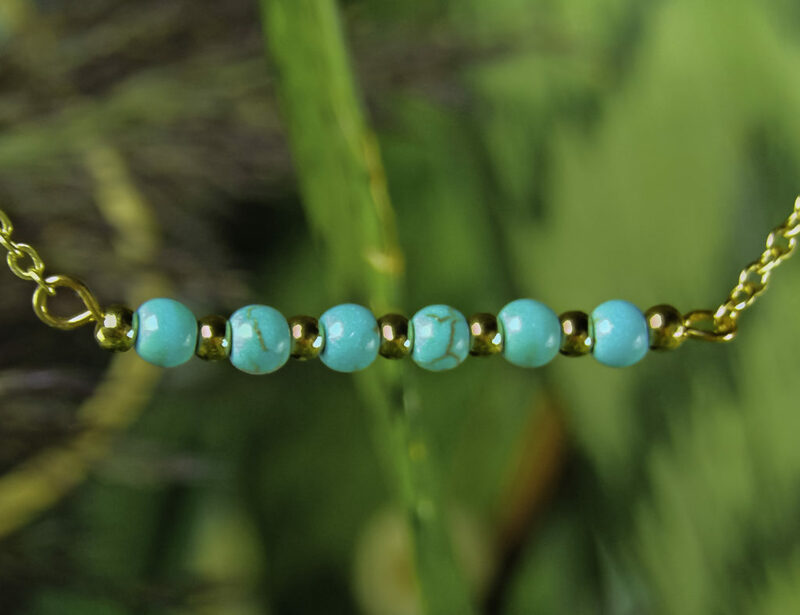 The shortest layer is choker length with a single turquoise cut-crystal shaped drop piece with a metallic base. 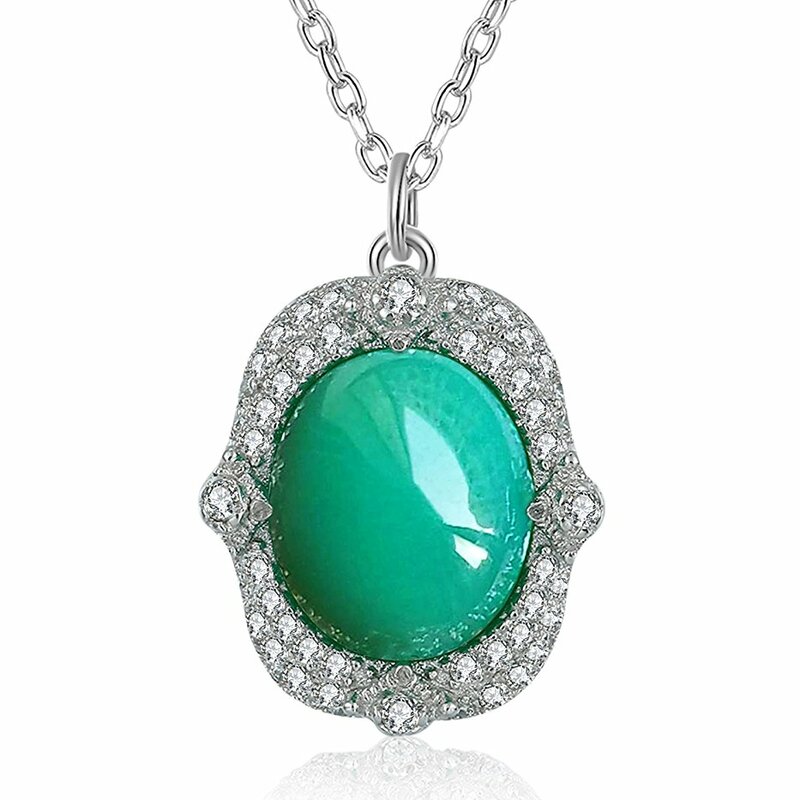 There is a variegated pattern within the turquoise. 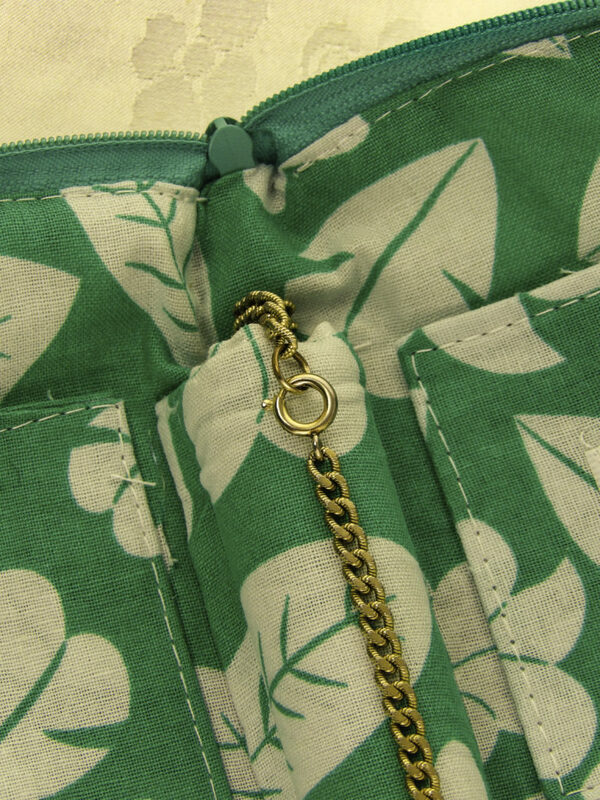 The middle layer has a single metallic circle to blend the elements together cohesively. 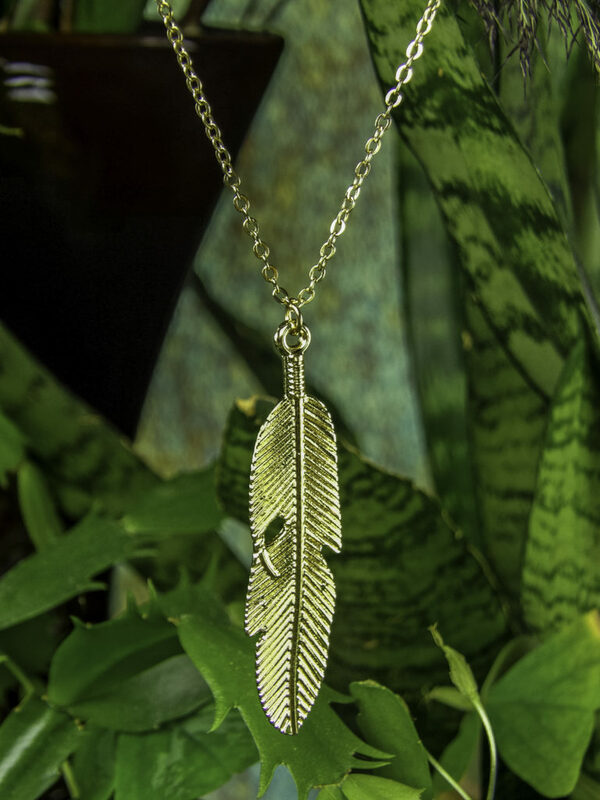 The longest strand with the feather element elongates and provides a slimming line, and adds some metallic detailing that is stylish and versatile. The turquoise with metal elements looks good with a variety of colors including blues and neutrals and compliments a natural look while adding a subtle textured metallic gleam. SEE IT WITH AN OUTFIT: Here are some sample outfits ideas. 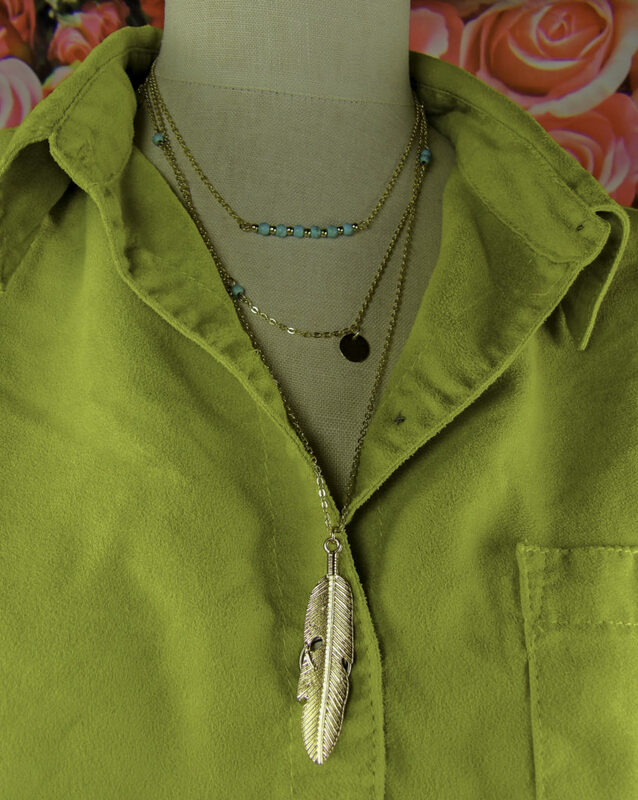 I like pairing the bolder elements of this necklace with silk, leather and suede fabrics. 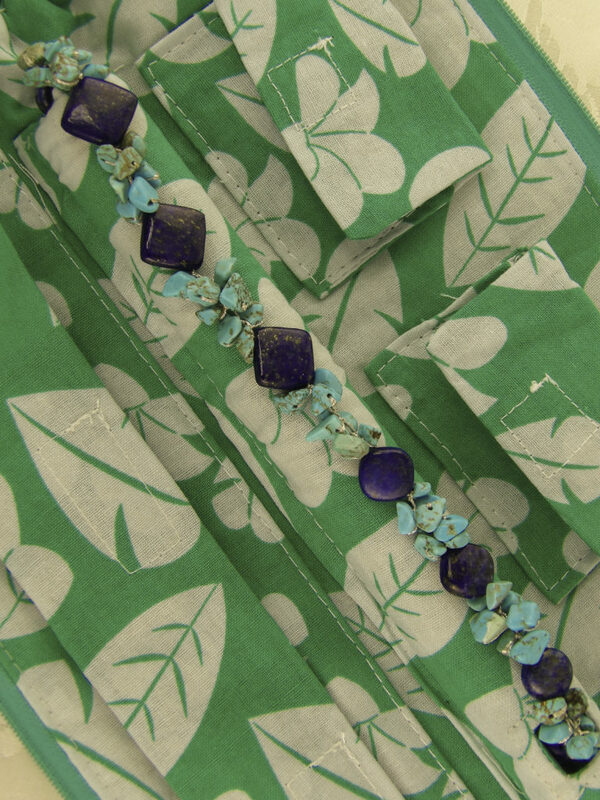 This piece contains turquoise combined with matte patterned metals shaped like natural and hammered elements. This piece combines the simplicity of three focal pieces at successive lengths to create a simple but eye-catching look. With three larger focal pieces, the eye is drawn to the shortest and longest chains while the middle chain is more simple. 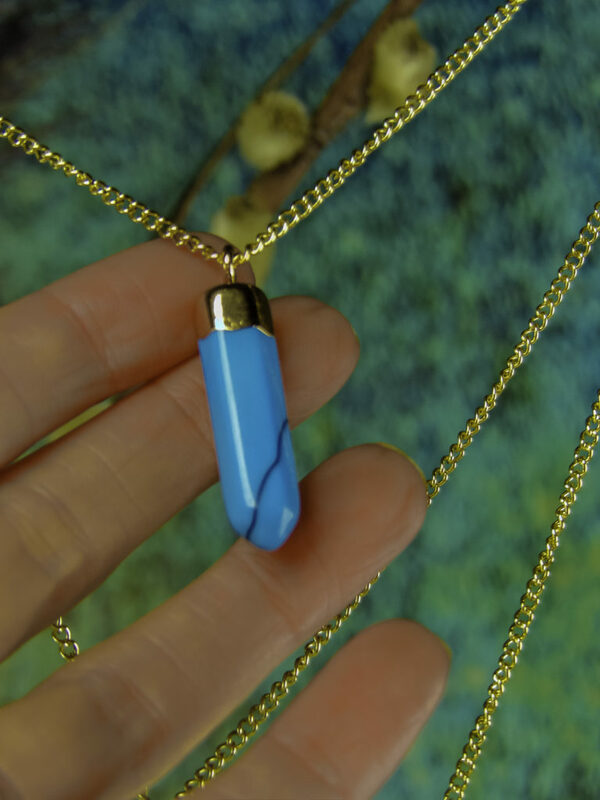 The shortest chain has brightly colored, textured larger variegated turquoise long bead formed into a natural crystal shape design, held at the base with a metal fastener. 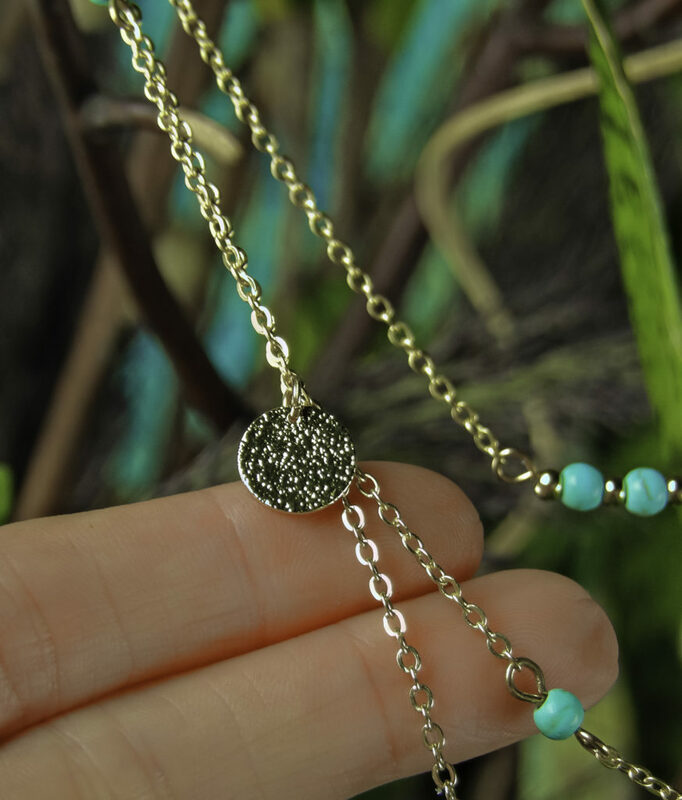 The center chain has round medallions and turquoise beads. 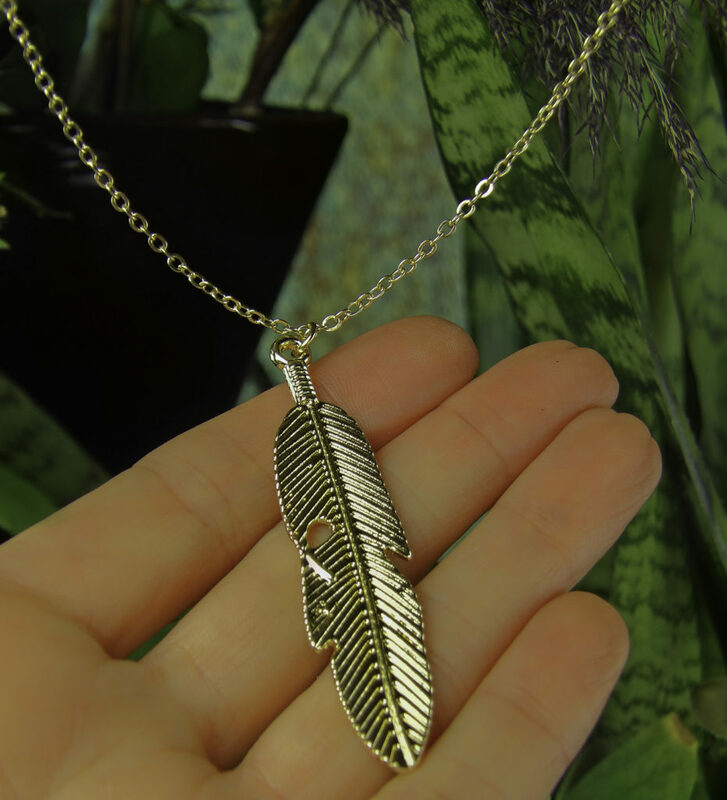 The third is a curved and detailed metallic feather. 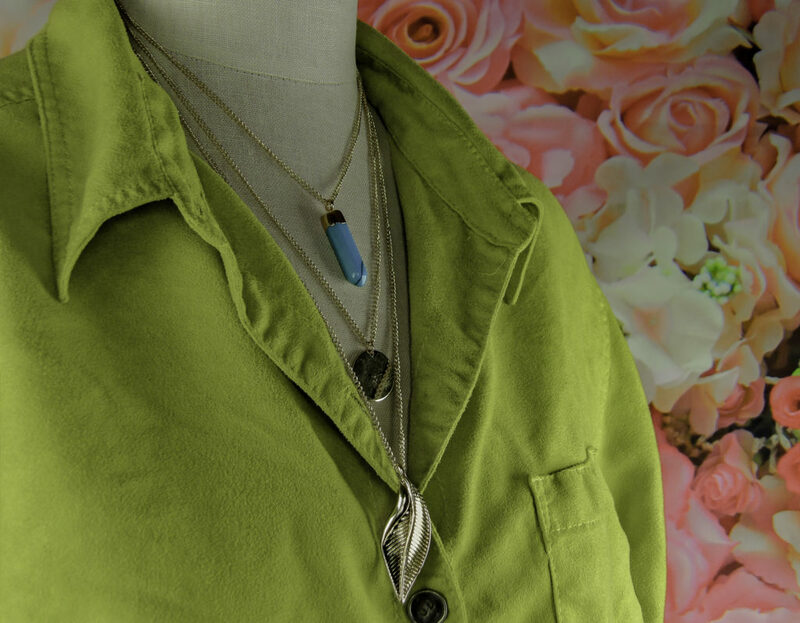 SEE IT WITH AN OUTFIT: While this necklace does have some color to it, it is highly versatile as a primarily metallic look that suits many outfit choices. 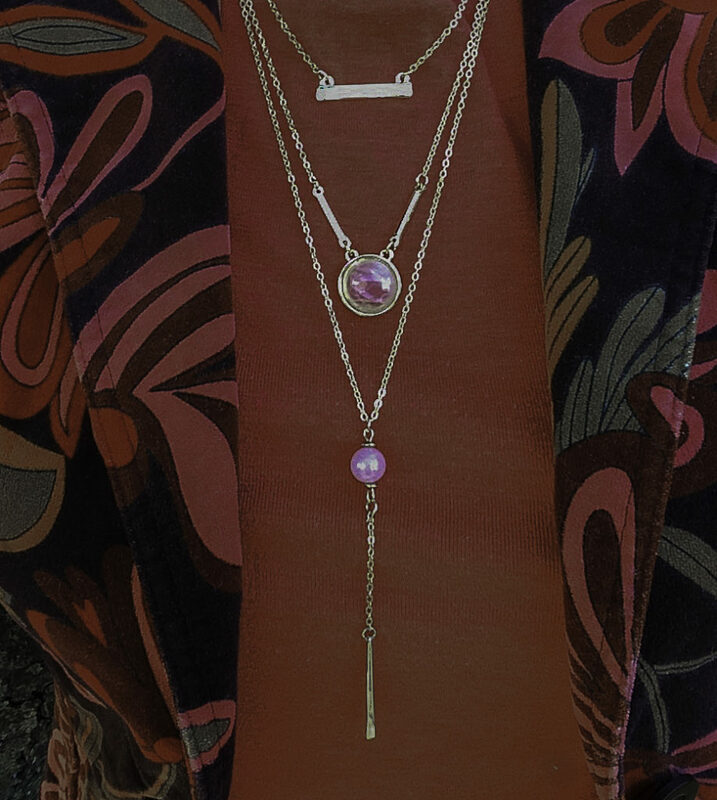 The Kisspat Layered Necklaces offer a stylish and versatile option for adorning a simple outfit with elements of visual interest without being too fussy or overly formal. 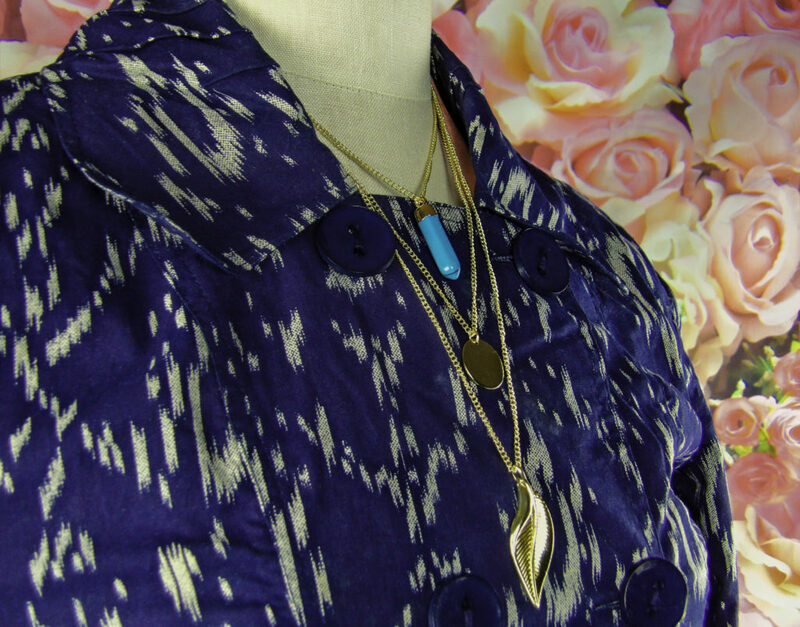 Add some detail to a plain outfit or tie together various colors with a unifying layered necklace. 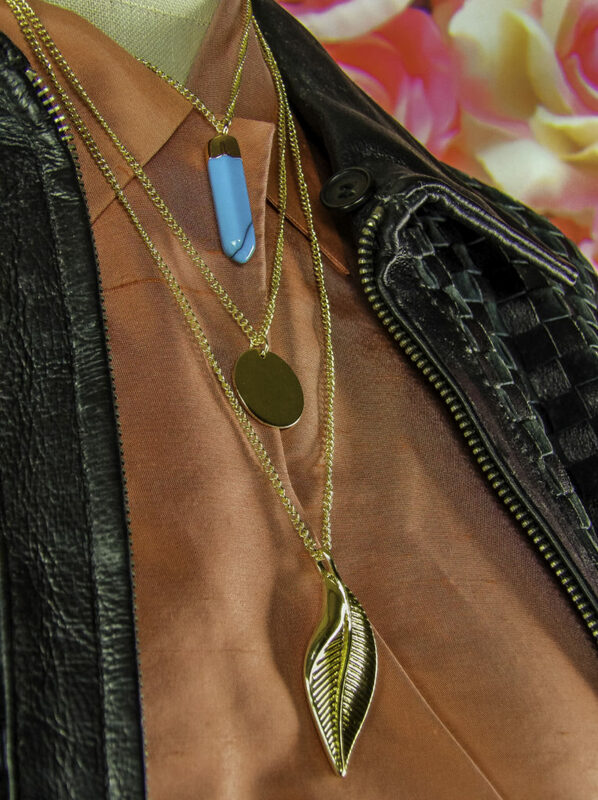 Style Chicks received the Kisspat Layered Necklace Bar Charm Chain with Rose Quartz Pendant, the Kisspat 3 Multi-layered Choker Necklace Turquoise Disc Chain with Leaf Pendant, and the Kisspat Multilayer Necklace Choker Gold Tone Turquoise Bead Chain with Feather Pendant in exchange for our unbiased review and received compensation for our time and effort. However, our experience with the product and the opinions expressed in this review are 100% ours. Pearls are one of the most versatile of the gemstone jewels, they can dress up a little black dress or be worn to a wedding, and depending on the setting and other stones, metals or jewels that a pearl is paired with, they can even be incorporated into semi-casual outfits or office appropriate workwear. Despite being a classic, go-to wardrobe piece, Pearls can, however, look a bit old-fashioned, which is why we love The Pearl Source’s unique pearls designs, which also come at a more attractive price point than many pearl pieces seen in stores. 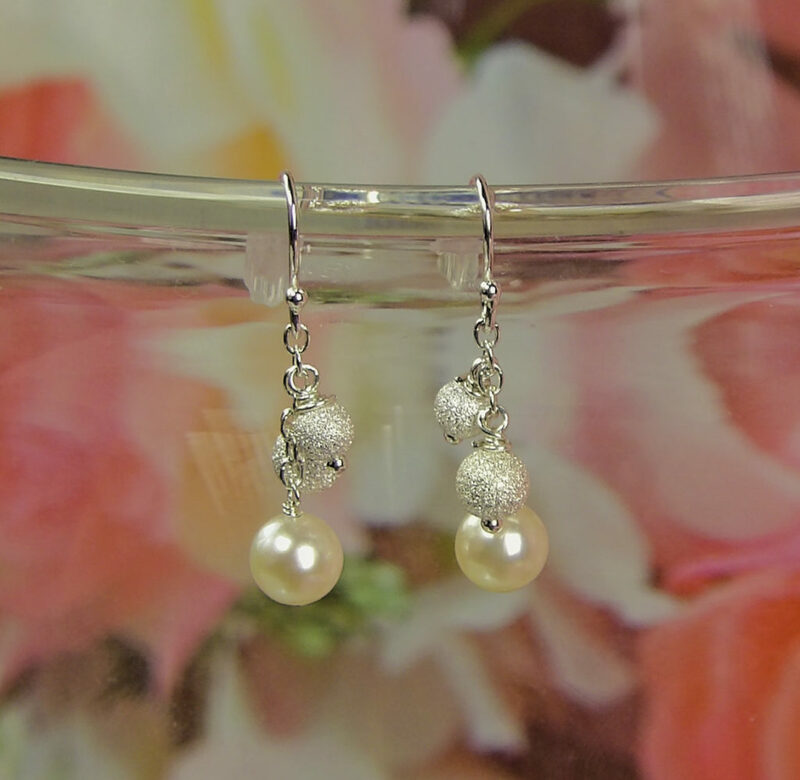 A good example of this is The Pearl Source’s Japanese Akoya Pearl Stardust Earrings, formal and classic enough for a traditional style bride, yet stylish enough for those with demure yet modern taste in jewelry. Each earring is comprised of one classic round Akoya Pearl Classic pearl on a gold base, 925 Sterling Silver coated drop chain. The earring drop is about one inch in length. The Pearls are AA+ Quality, which is higher than that typically found in department stores and mall jewelry stores. Akoya Pearl with two smaller stardust orbits. Gold with .925 Sterling Silver overlay makes them sturdy. Above the pearl, there are two suspended small silver drop ball orb embellishments with a stardust pattern to add a bit of very subtle shimmer, not full-on bling, but they are eye-catching. The thick nacre content of these pearls makes them durable despite being on a drop length dangle, they will not scratch even though they are exposed to other dangling embellishments. 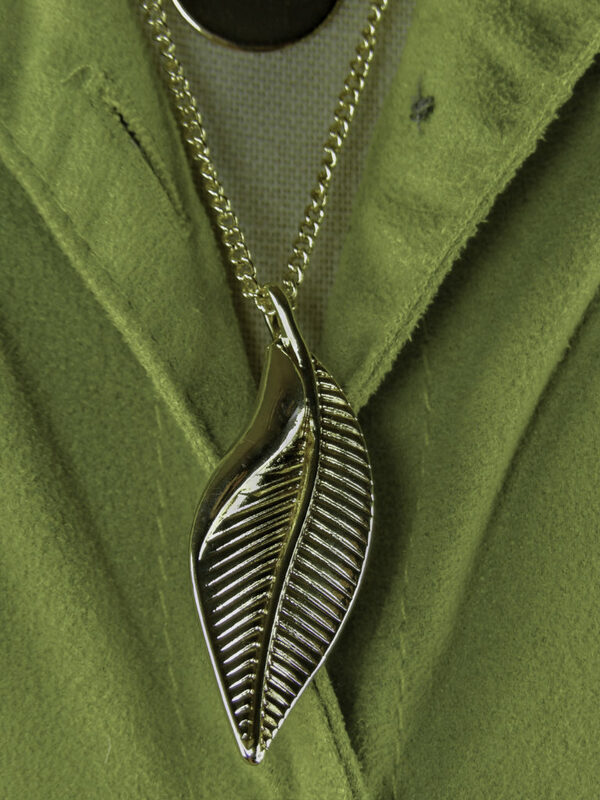 The chain is gold with a generous .925 Sterling Silver coating. The post is sturdy and does not readily bend. When selecting a pearl jewelry piece, there are three notable characteristics to assess. 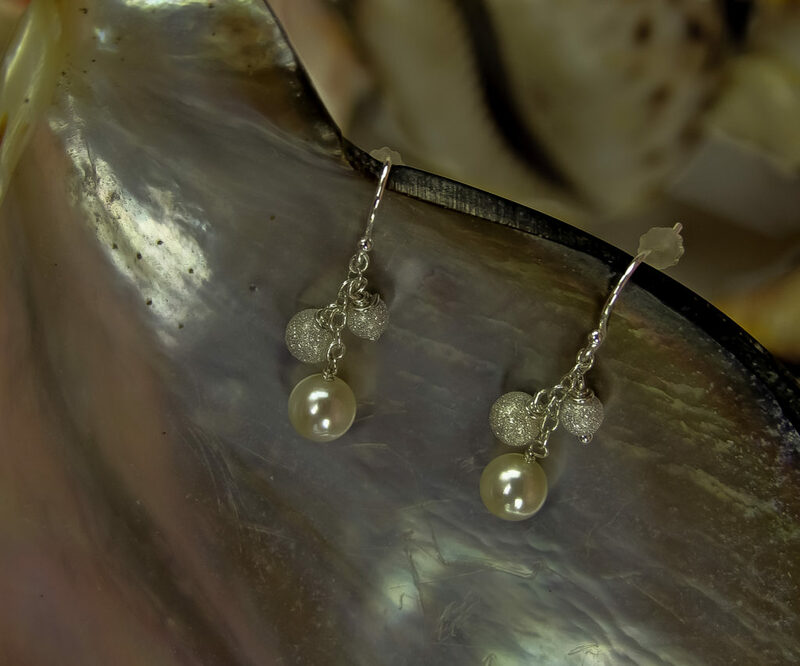 These are the Pearl Luster, the Pearl Nacre, and the Pearl Overtone. Pearls produce an intense shine, also known as luster. 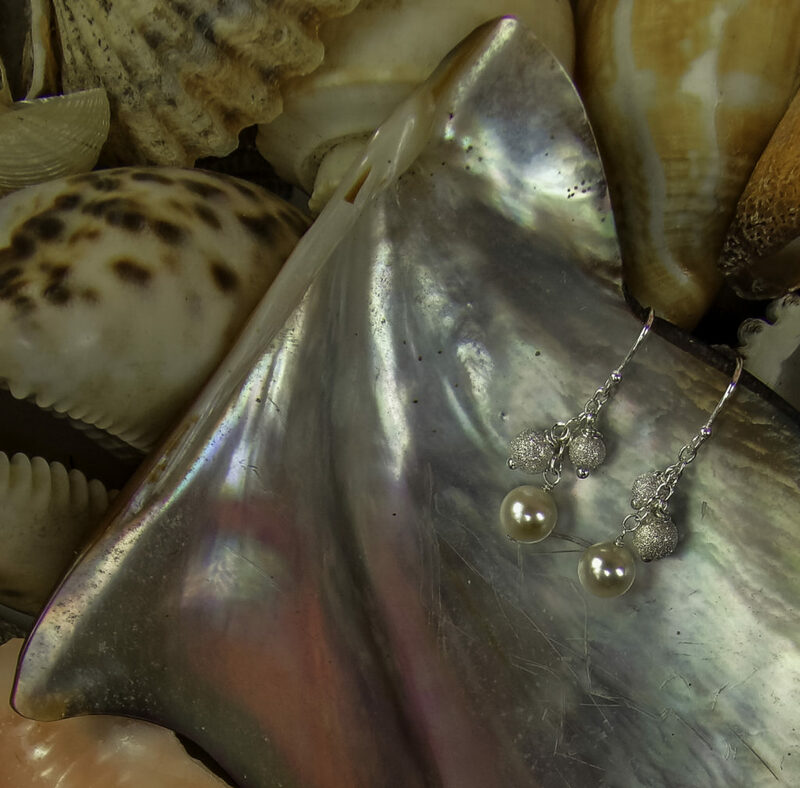 The luster of a pearl can be determined when a light is reflected off the many layers of nacre or tiny organic crystals that comprise the surface of the pearl. 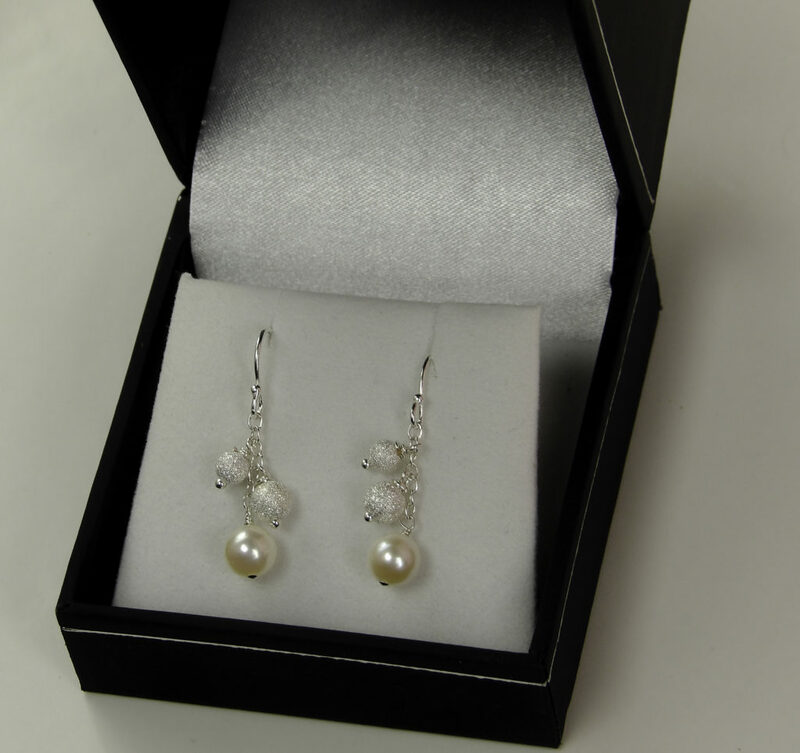 The luster rating of this Japanese Akoya Pearl Stardust Earring Set is considered “very high”. Nacre is what gives pearls shine and resilience. Nacre is very similar in composition and appearance to the composite material inside of a mollusk shell. The iridescent nacre can be seen for example inside a nautilus shell and to some extent abalone. Nacre is comprised of tiny organic crystals, which serve as reflectors of light. The larger a pearl is, the more reflectors it possesses. When shopping for a pearl, the larger the pearl, the more nacre it has and the greater the luster. The degree of nacre produced luster varies greatly between pearls. 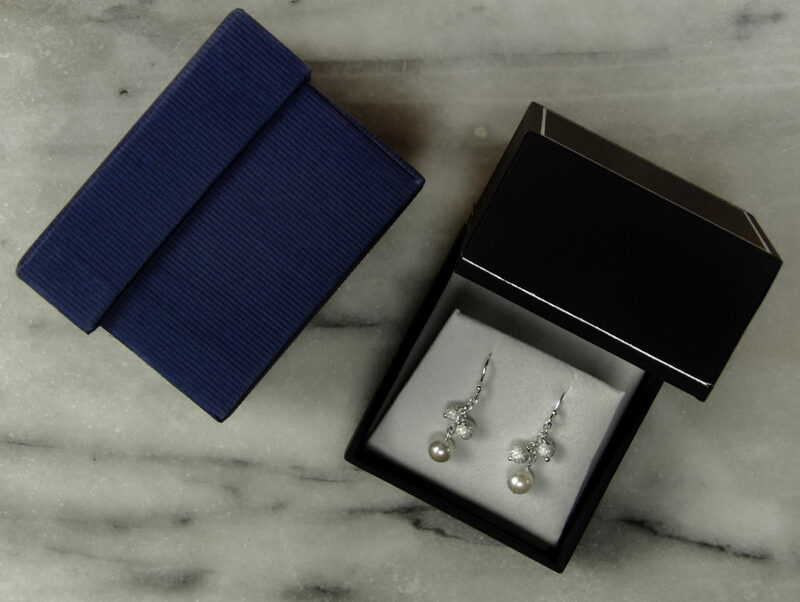 This Japanese Akoya Pearl Stardust Earring Set has a very thick nacre, creating a high luster. A pearl’s color is called the body color. 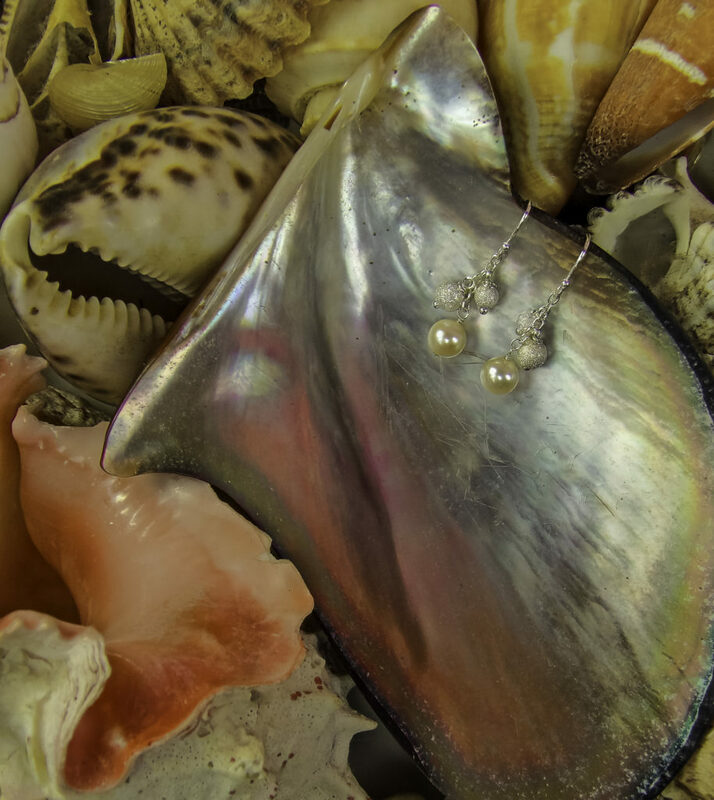 Pearls vary from white, cream, yellow, silver, pink or black. 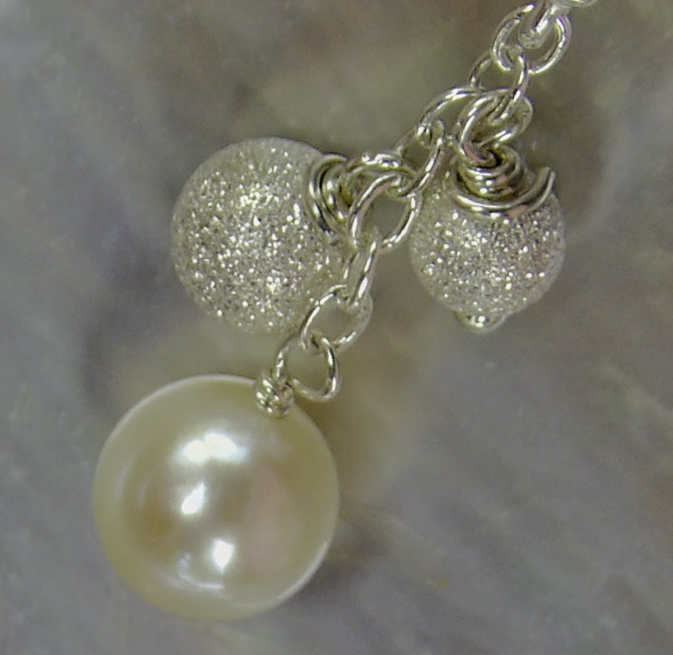 Pearls also have a glow of a secondary color, which can be seen when light reflects off of the pearls. This hint of color is known as its’ overtone. 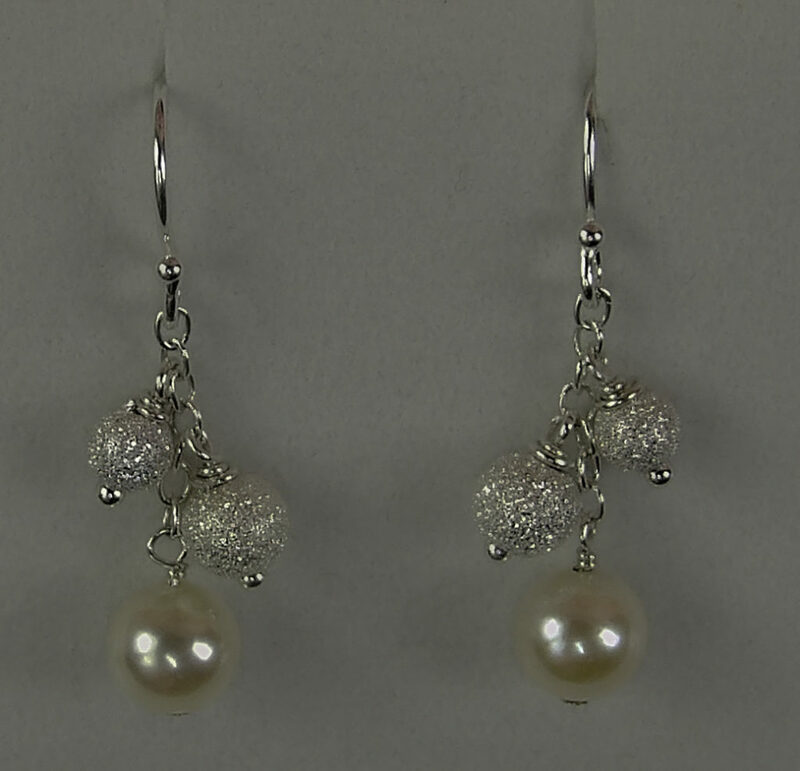 The Pearl Source Japanese Akoya Pearl Stardust Earrings are a white body color that is available in four overtones. 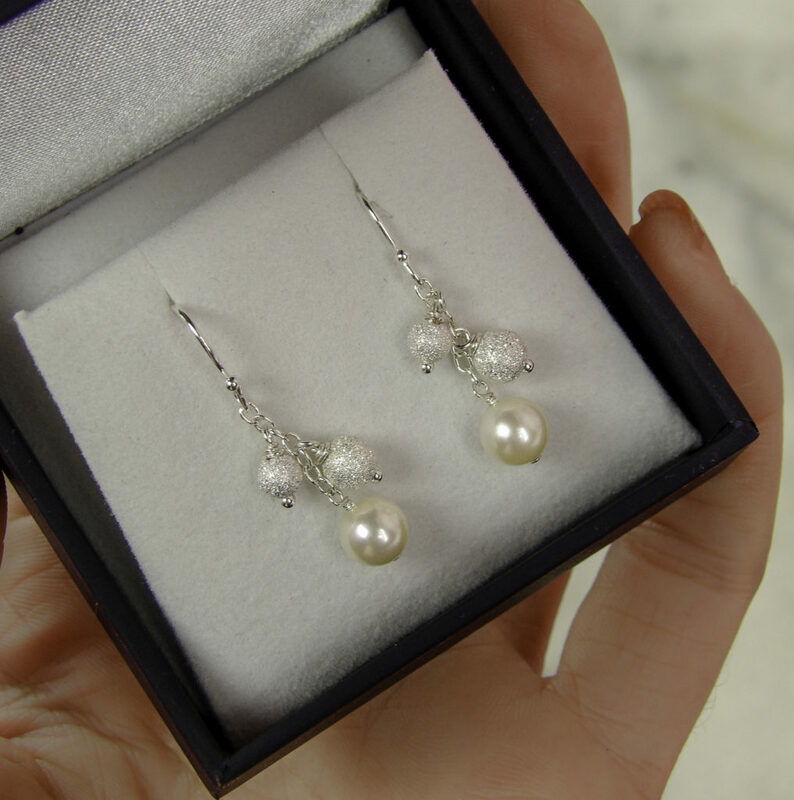 The set shown here is a White Overtone Pearl, but they also come in Rose and Ivory overtones as well as Black. These choices are ideal for matching the undertone of a bridal gown so the shade of white is not a mismatch. WHAT IS AN AKOYA PEARL? Akoya pearls are cultured in Akoya oysters primarily in Japan and China. 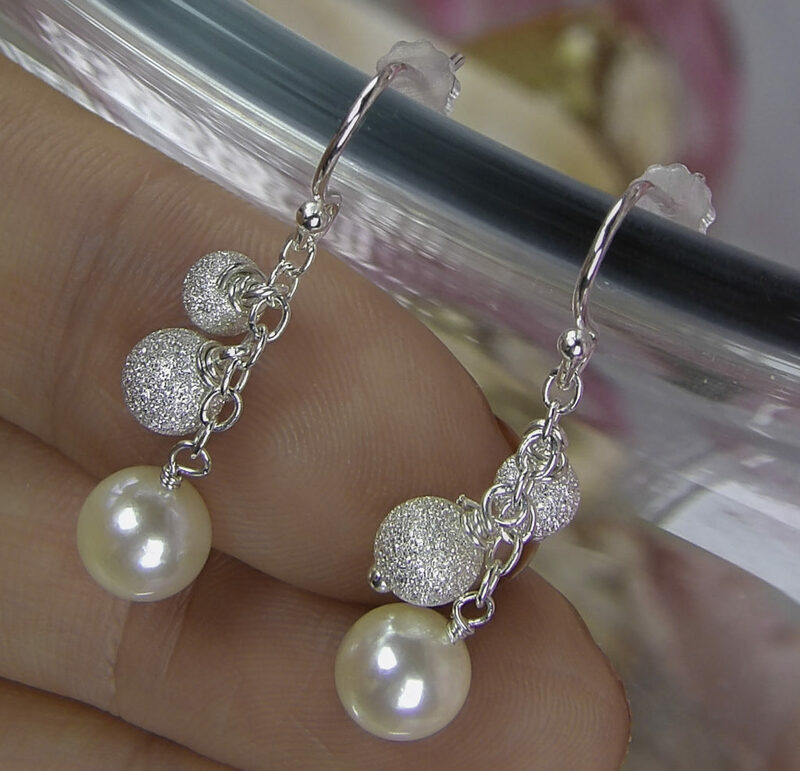 They are renowned for their incredible luster and are generally considered the “classic” pearl. Akoya pearls range in size from about 6.0 – 8.5mm. 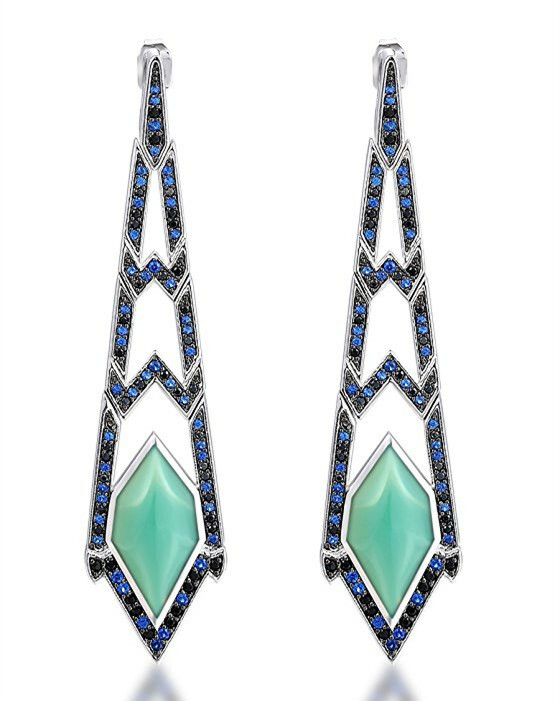 The earrings come in a distinctive blue box with a grosgrain pattern crisp overlay, and an inner hinged style box with traditional satin and velvet lining. 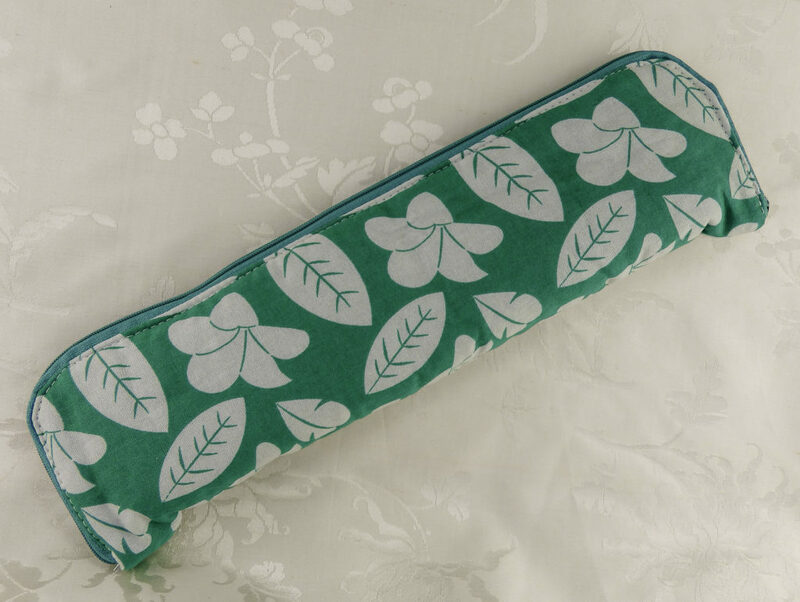 It is highly suitable for gift giving and storage. The Pearl Source only uses the highest quality grade of pearls from the Pinctada fucata oyster in Japan, and only uses pearls without defects. I found these pearls to be of better quality than that I have purchased at department stores. Because their pearls are imported direct, the cost is much less than other online and brick and mortar jewelry stores. The Pearl Source Pearls for gifts and bridal jewelry or just for your personal collection is higher quality and at a better price. They also offer free shipping on all orders. 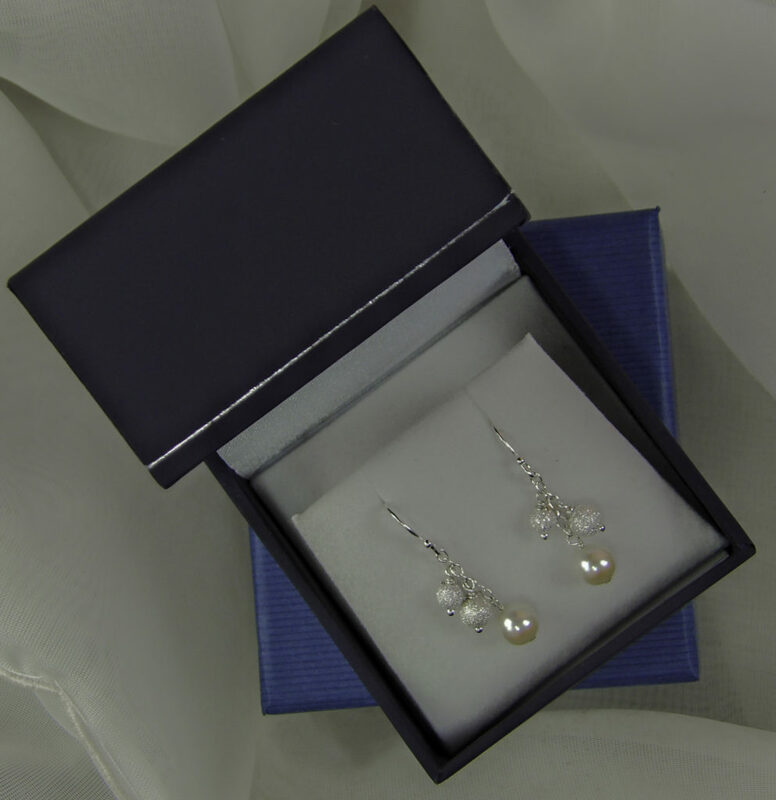 The Pearl Source Japanese Akoya Pearl Stardust Earrings are an outstanding value for a bride, as a gift for a teen attending a formal event, or for anyone who would like a demure, ladylike piece that gives an updated look to a classic design. The pair of stardust dangle orbs brings some visual interest to the single statement pearl. The pearls themselves are of high luster, thick nacre and come in four overtones to best match one’s skin coloring or attire. 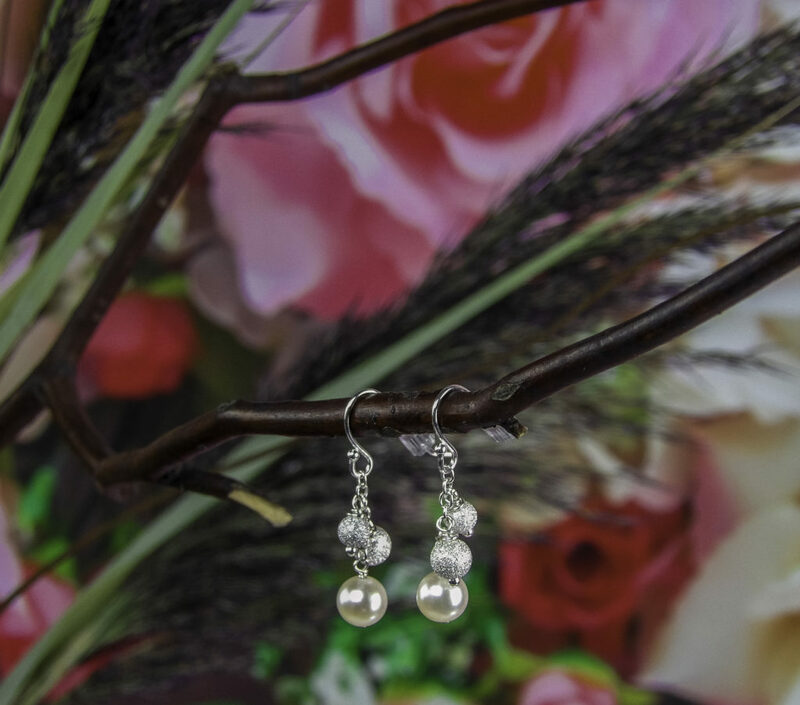 The direct sourcing of the pearls makes The Pearl Source jewelry an excellent value on a highly versatile set of earrings that will last for years to come. 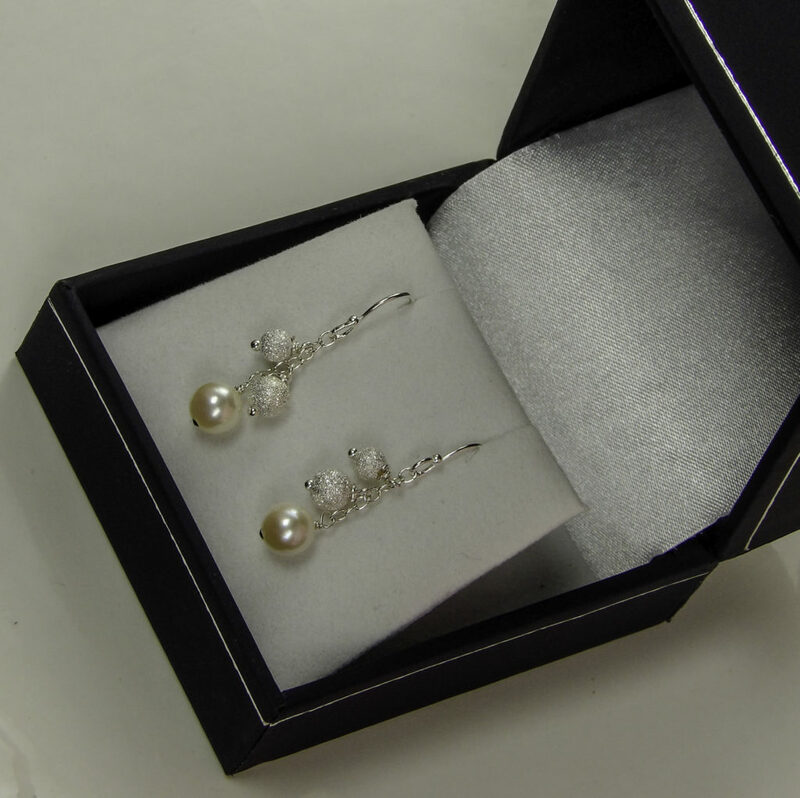 Style Chicks received The Pearl Source Japanese Akoya Pearl Stardust Earrings in exchange for our unbiased review and received compensation for our time and effort. However, our experience with the product and the opinions expressed in this review are 100% ours.